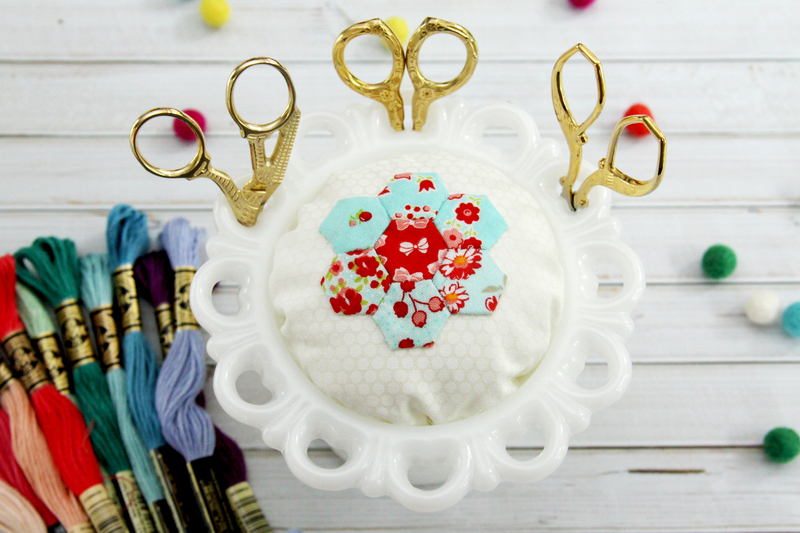 I thought it would be fun to have a central place for all of the embroidery and sewing patterns I’ve made – for quick and easy searching and download! I’ll try and keep this page updated as I create new projects. 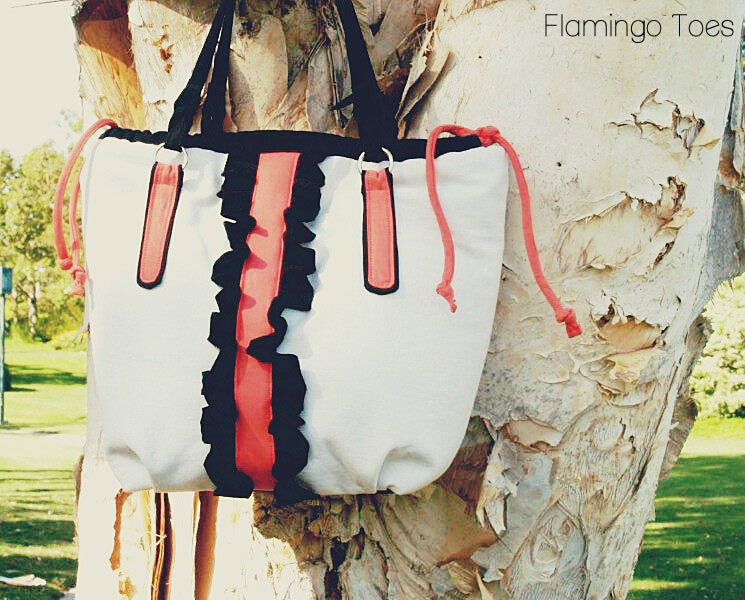 *Please keep in mind that all Flamingo Toes patterns are for personal use only. Do not transfer or sell the patterns, or items made from the patterns. Also, patterns are free for Flamingo Toes followers, so please choose to follow along in some way before downloading any pattern. Thanks! Please wait -Portfolio can take a little bit to load! 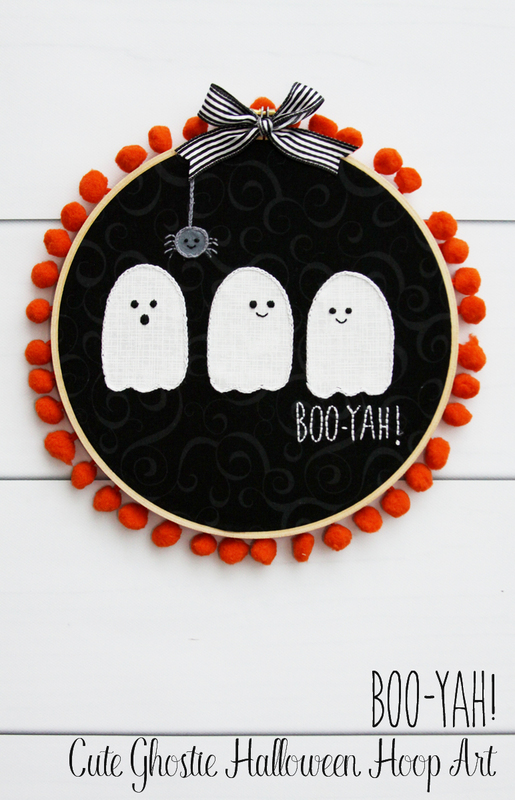 Celebrate Halloween with this super cute embroidery hoop! 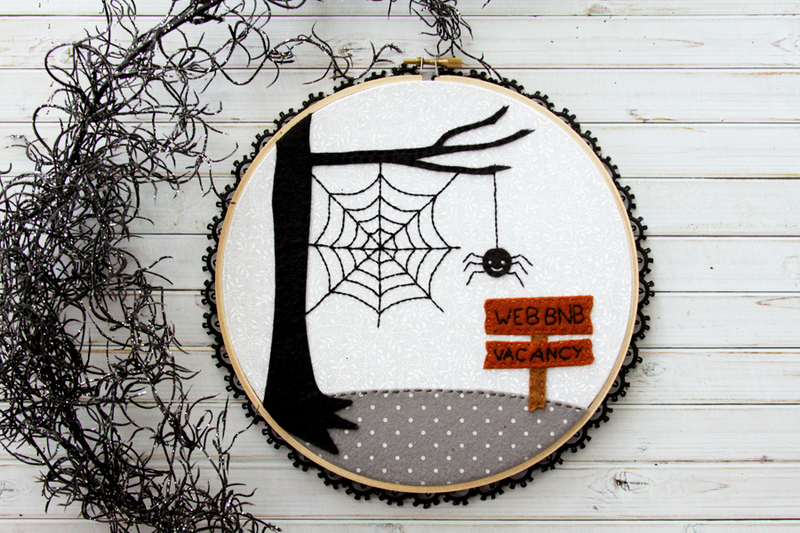 Get into Fall with this super cute retro hoop art! 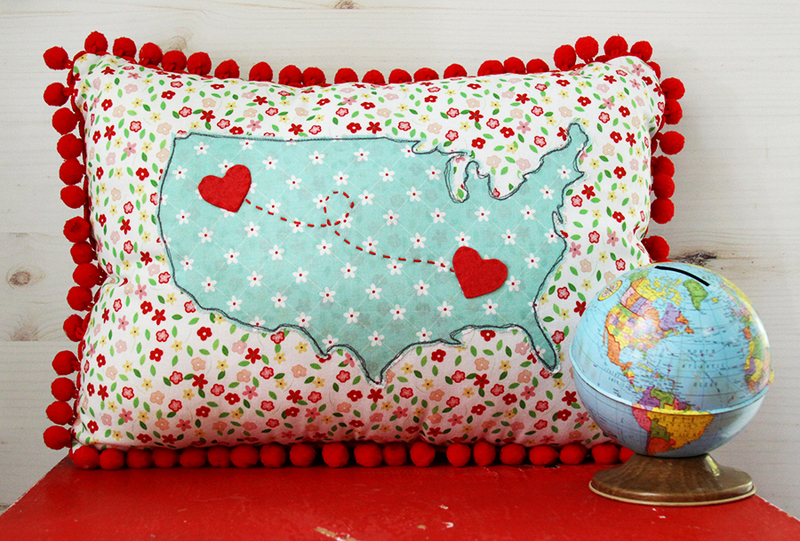 Show off your travels with this super cute map pillow! 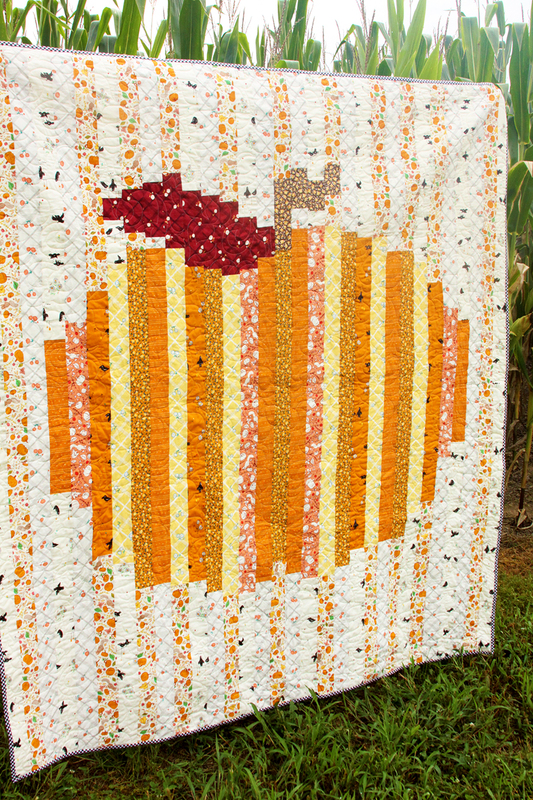 Celebrate Halloween with this fun and colorful pumpkin quilt! 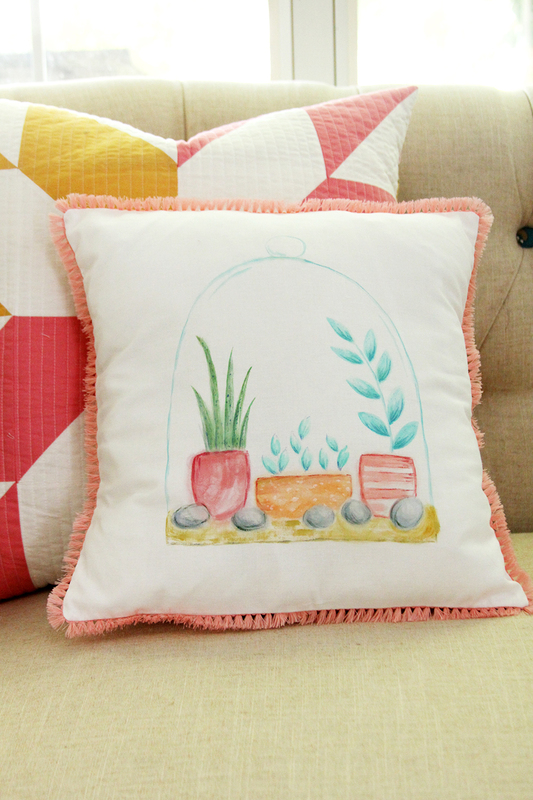 This pillow is so easy to sew and fun to paint! 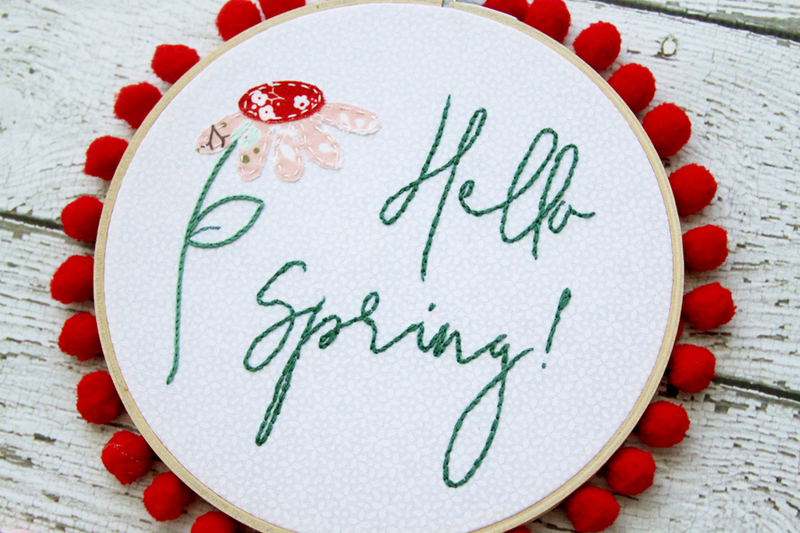 This embroidery hoop art is the perfect project for Spring! 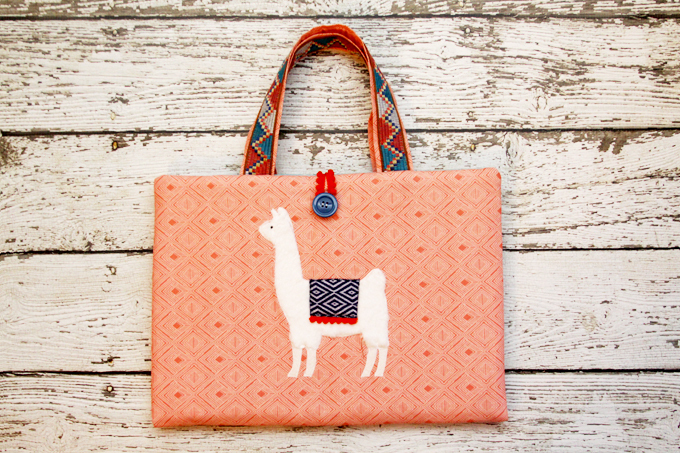 Decorate this fun Art Caddy with a cute Llama pattern! 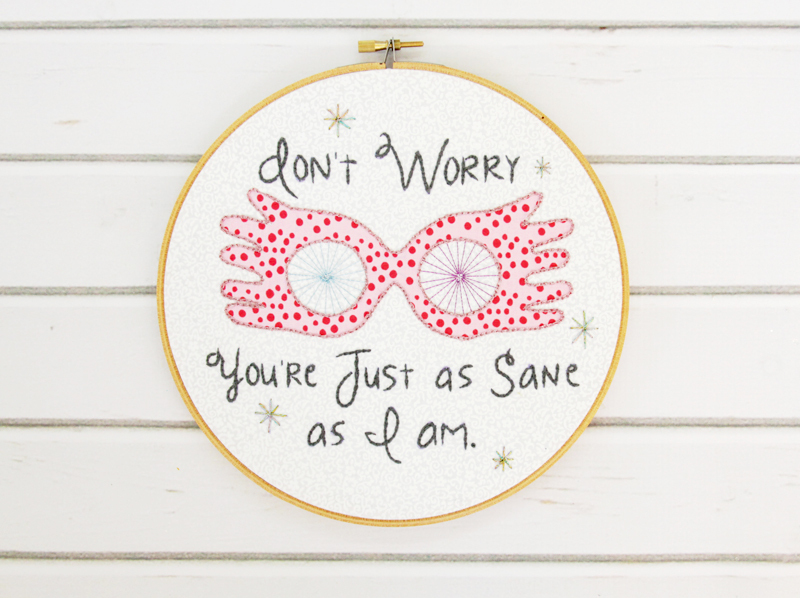 The design would be so cute on a pillow or hoop too! 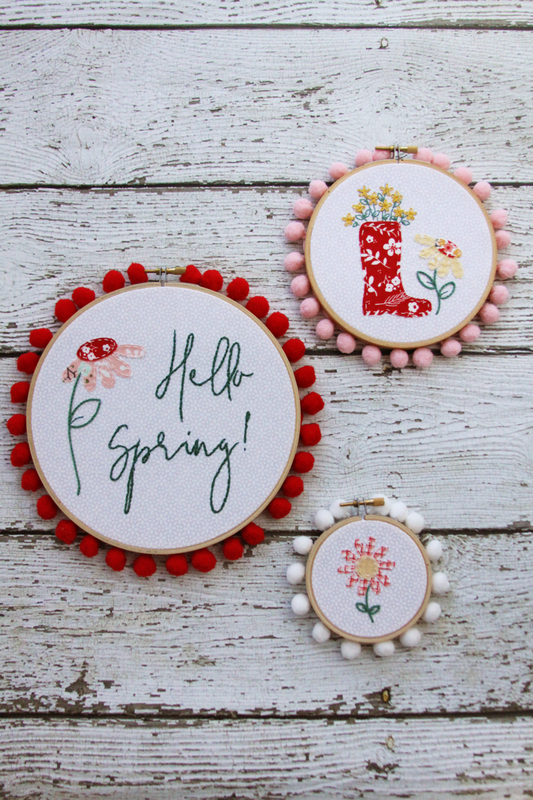 These small floral embroideries are so cute and go great together. 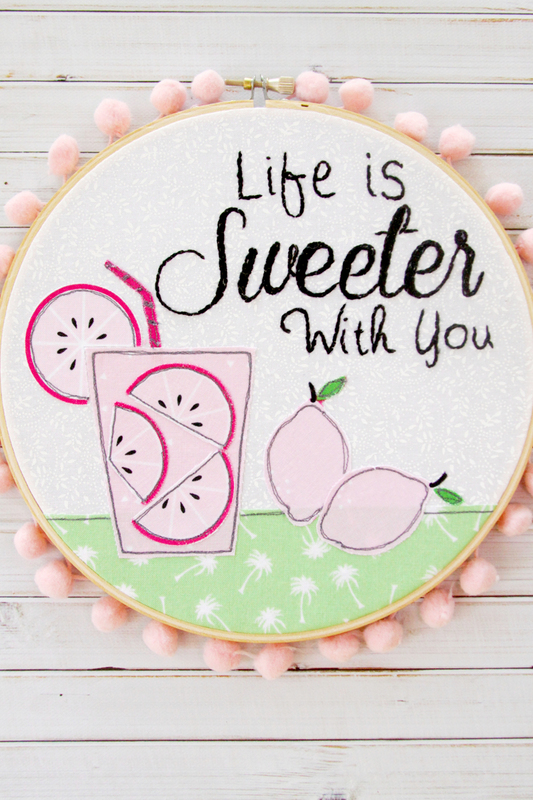 This super cute embroidery is great in a set or just by itself! 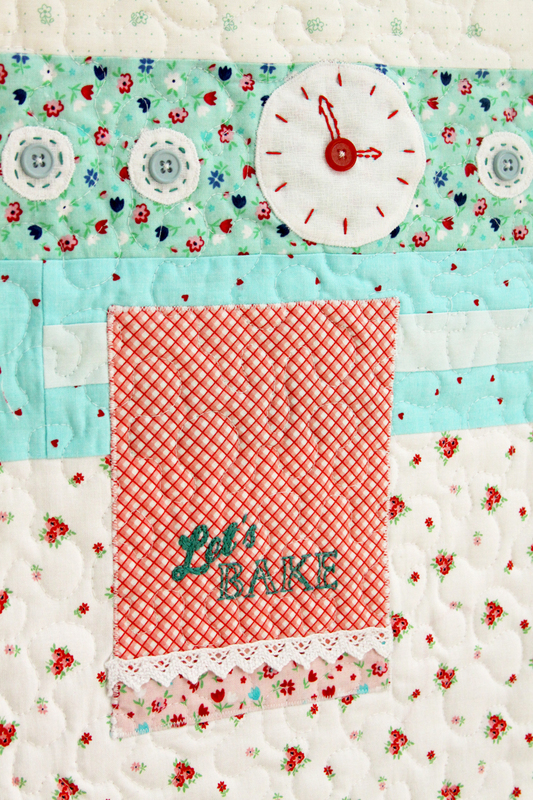 This 'Let's Bake' embroidery is perfect with this mini quilt and hoop art! 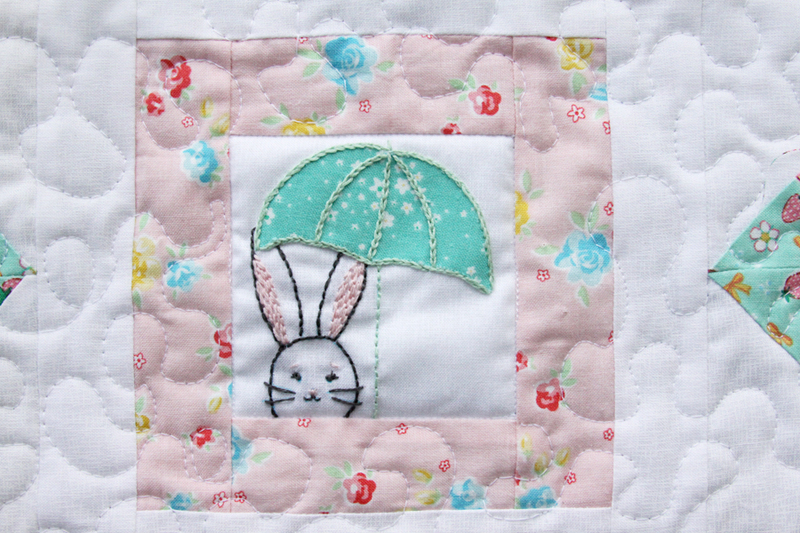 This bunny embroidery is so cute with this mini quilt but would also be perfect anywhere else! 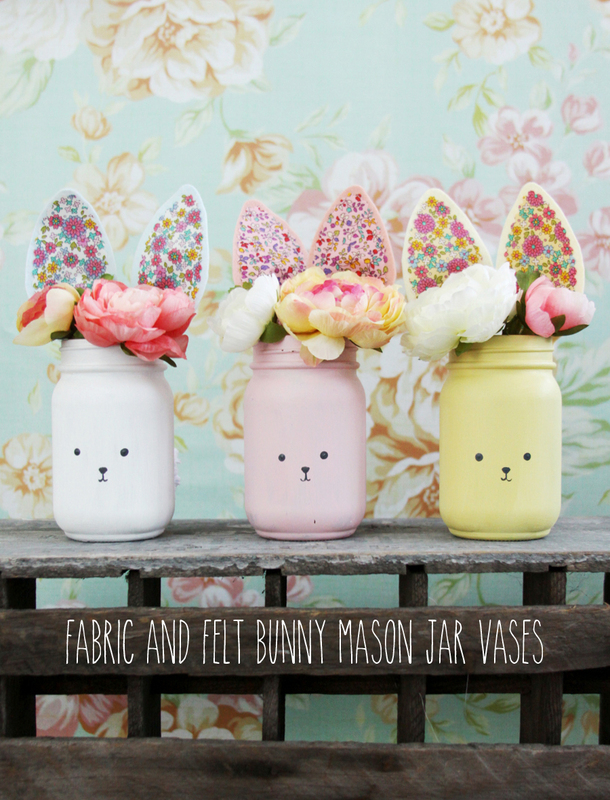 These cute bunny vases are perfect for Spring. Click VIEW MORE below for the tutorial and pattern. 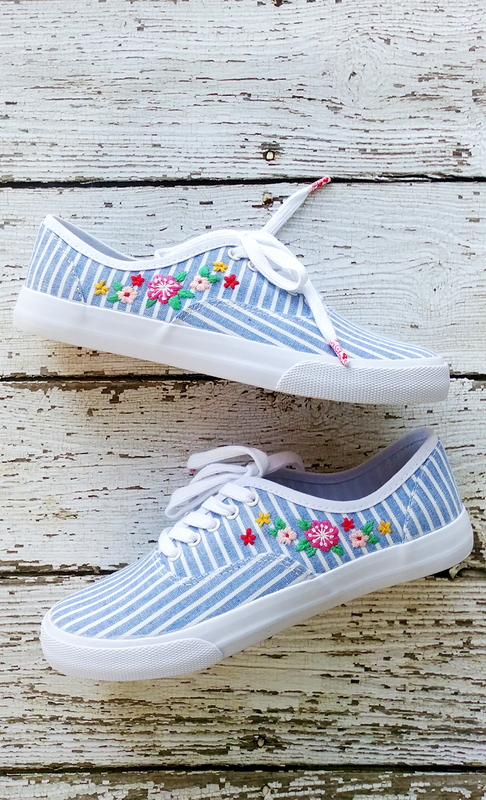 Make a plain pair of shoes unique with this floral embroidered pattern! 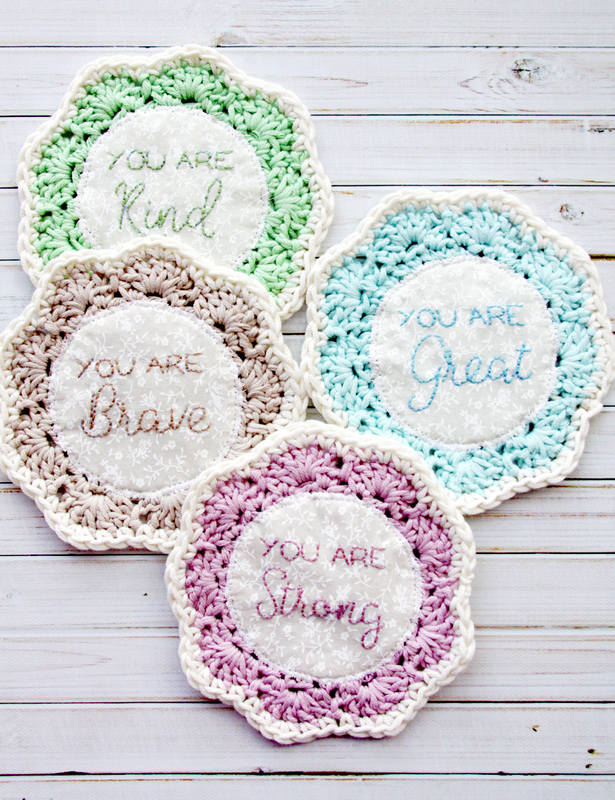 Give yourself or a friend a pep-talk with this pretty and encouraging hoop art! 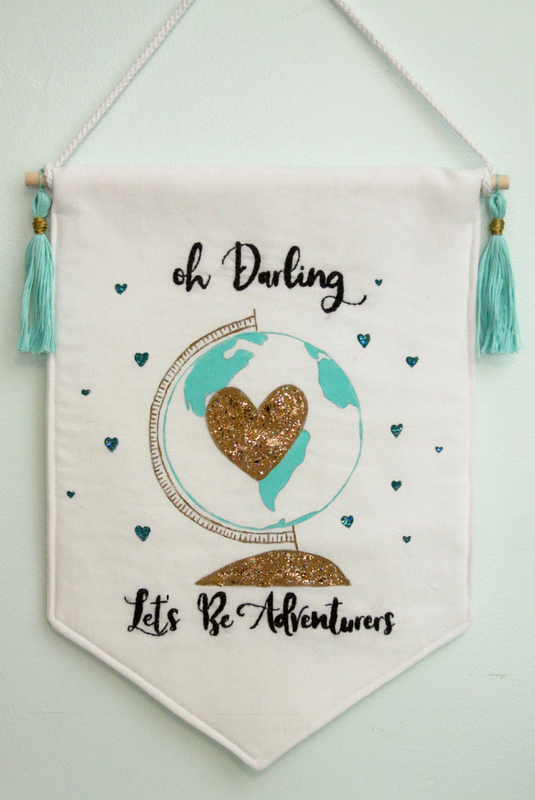 Show off your love for travelling and adventuring with this super cute banner! 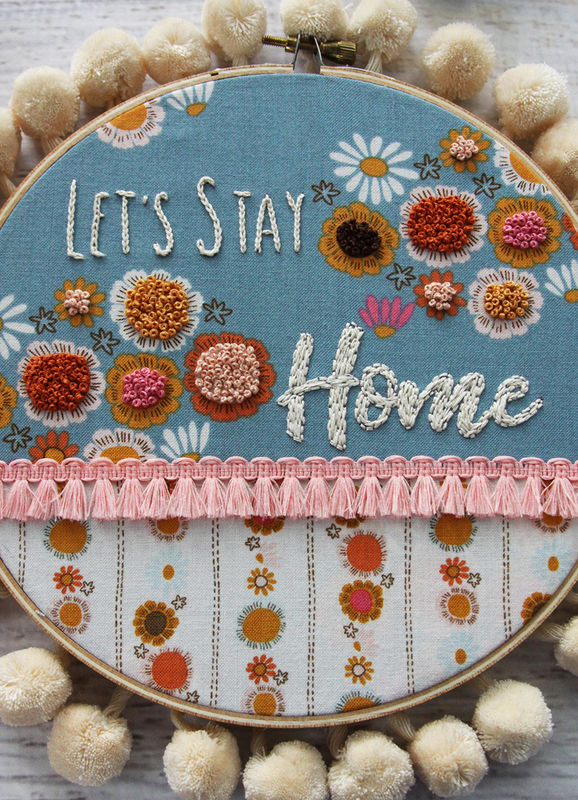 These sweet coasters are a fun combination of crochet and embroidery. They make a great gift for a friend too! Click View More below for the Embroidery lettering pattern. 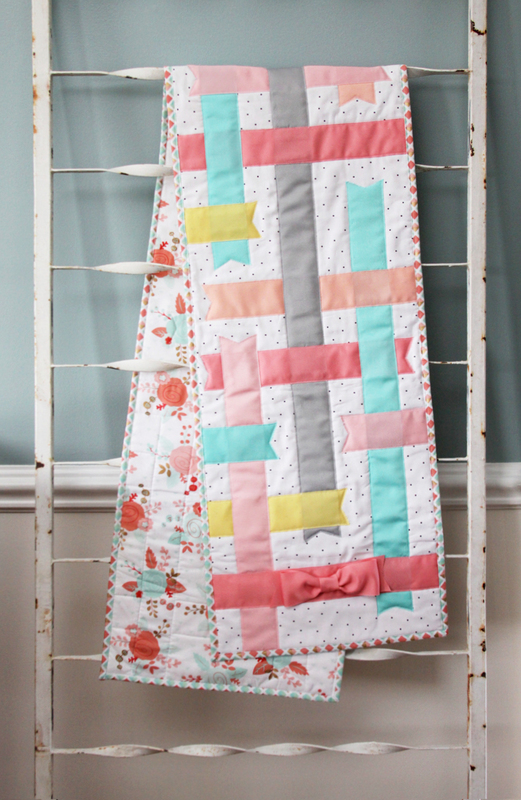 Make this super fun and colorful quilt! Perfect for people with a retro style. 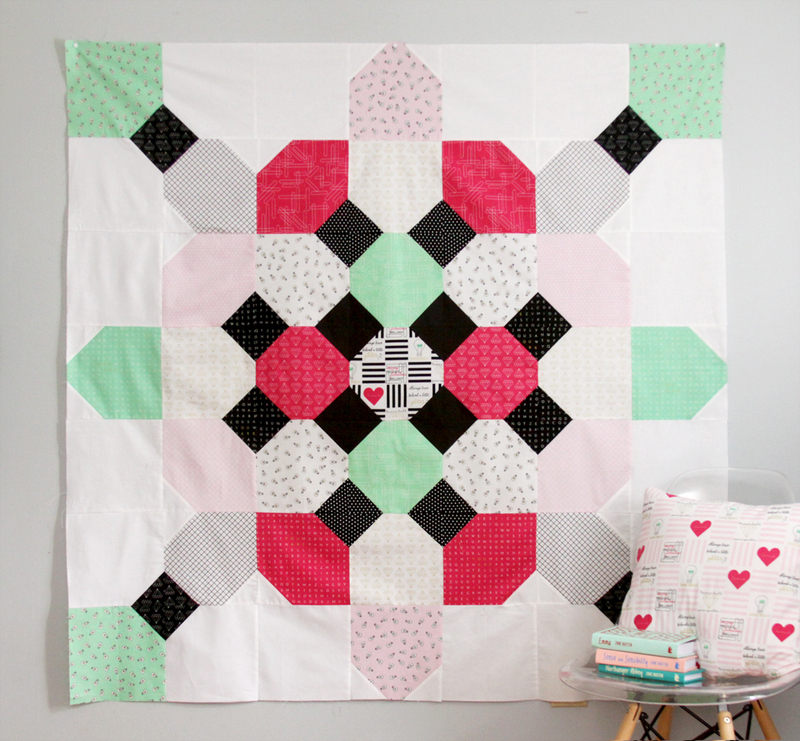 Start Valentine's Day off with this sweet mini quilt! 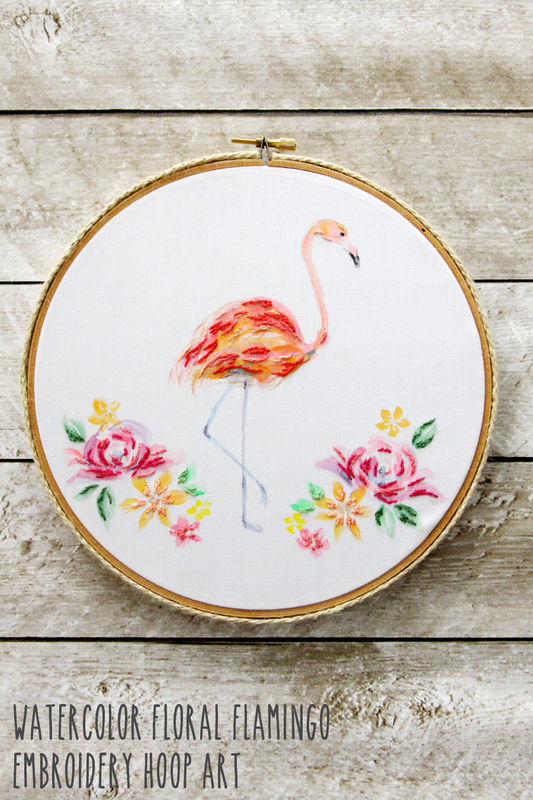 This fun flamingo cross stitch is a great project to just do at home or to make on the go! 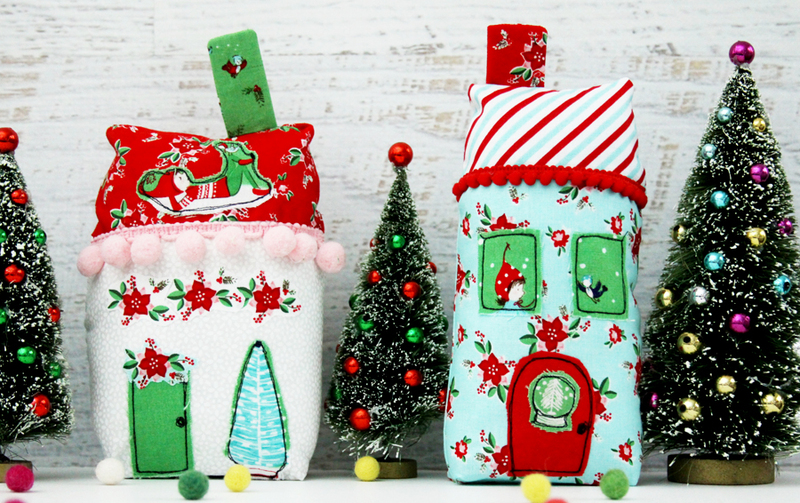 Sew up this cute Christmas town and mix and match the pattern pieces for more designs! 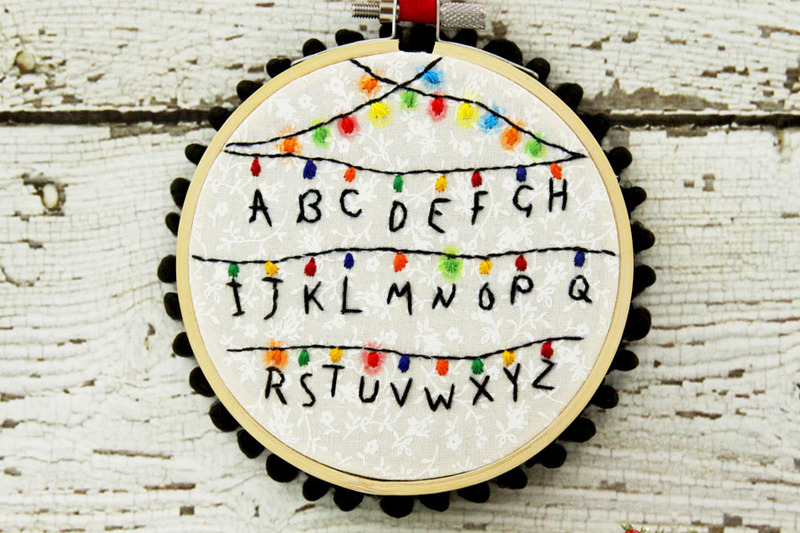 Embroider this super cute ornament for Christmas or just because you love Stranger Things! 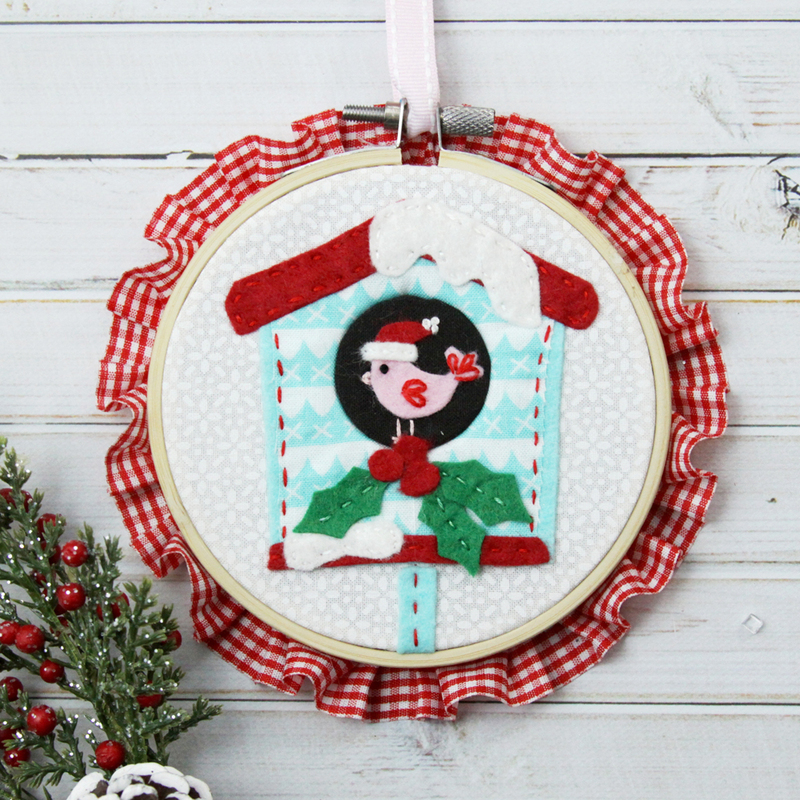 Make this super cute birdhouse hoop ornament for our home or give as a gift to someone else! 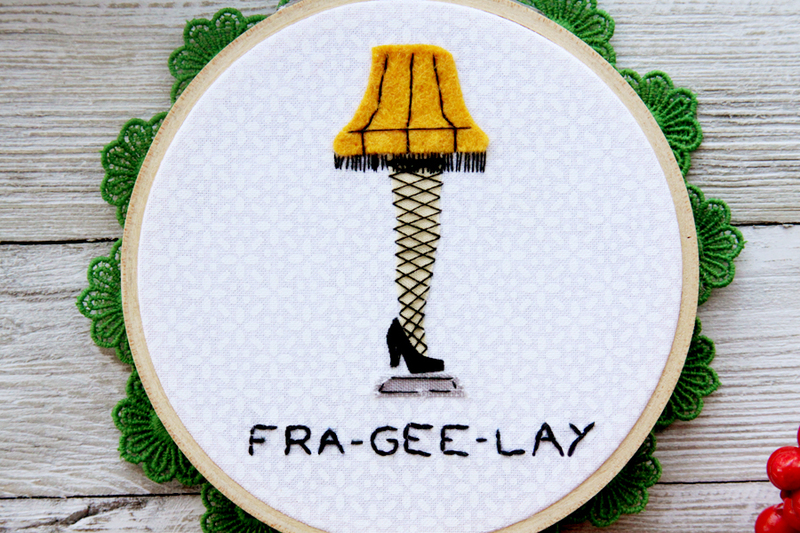 This embroidered lamp ornament is perfect for everyone who loves A Christmas Story! 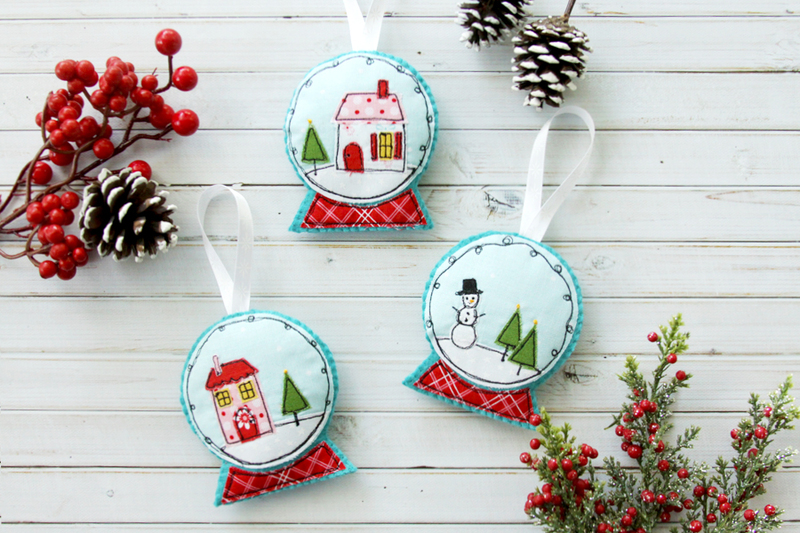 These fun snowglobe ornaments are great for beginners in sewing or embroidery! 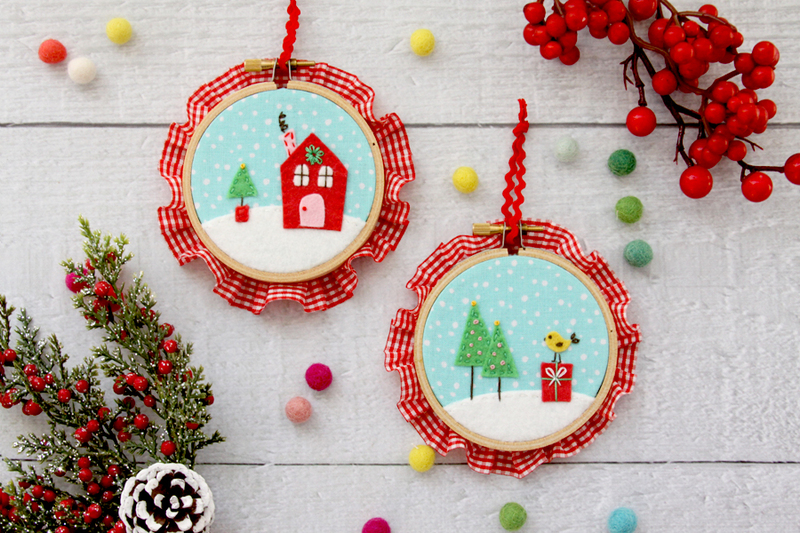 Stitch up these sweet 3" mini hoop ornaments to decorate your tree or as gift toppers! 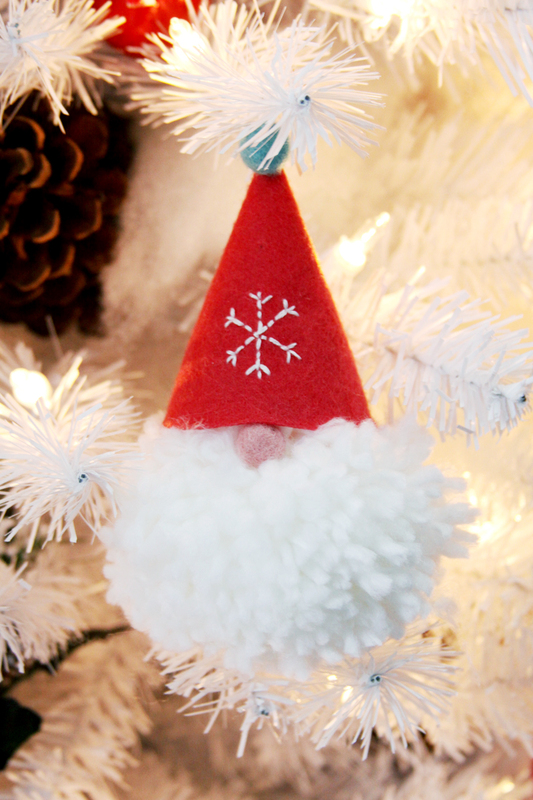 Make these super easy and fun little gnome ornaments as gifts or for decoration! 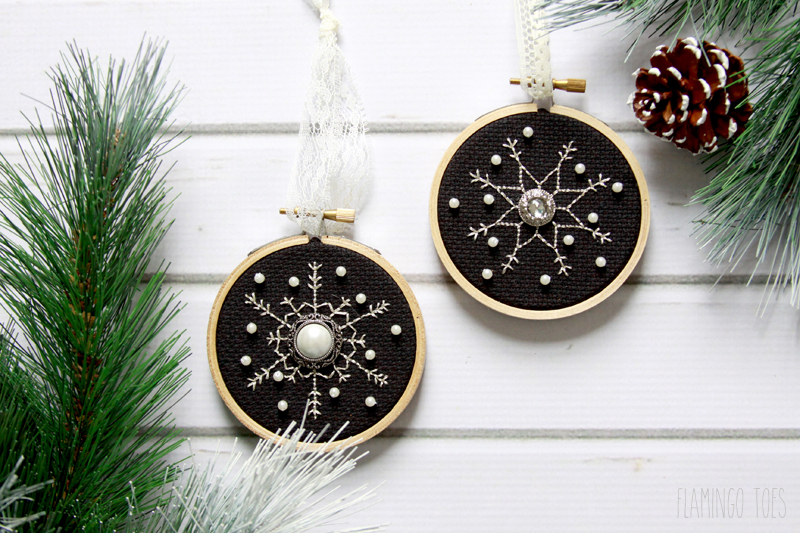 Make this adorable mini hoop art as a gift topper or just a regular ornament! 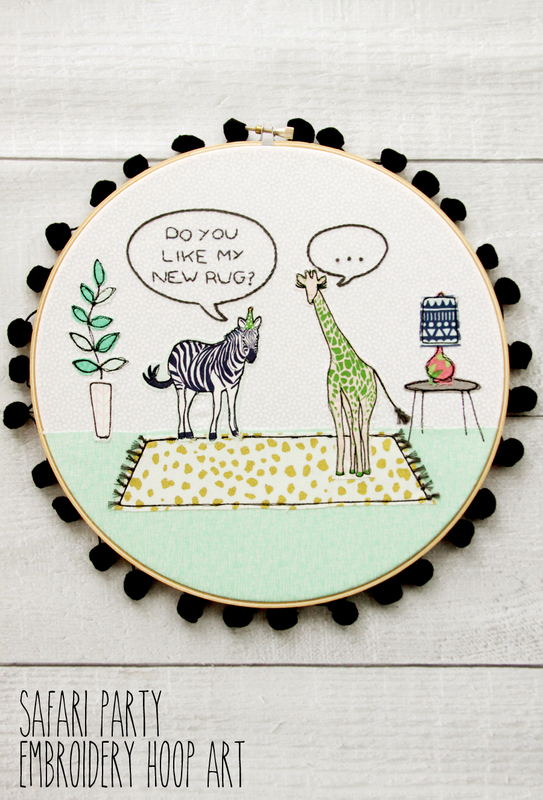 Show off your animal love with this fun Safari Party hoop art! 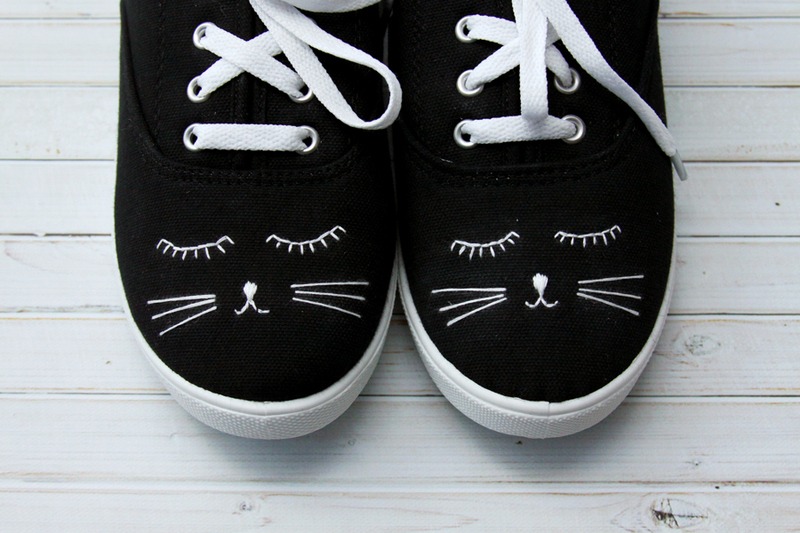 These super cute shoes are great for Halloween but can be worn all year long! 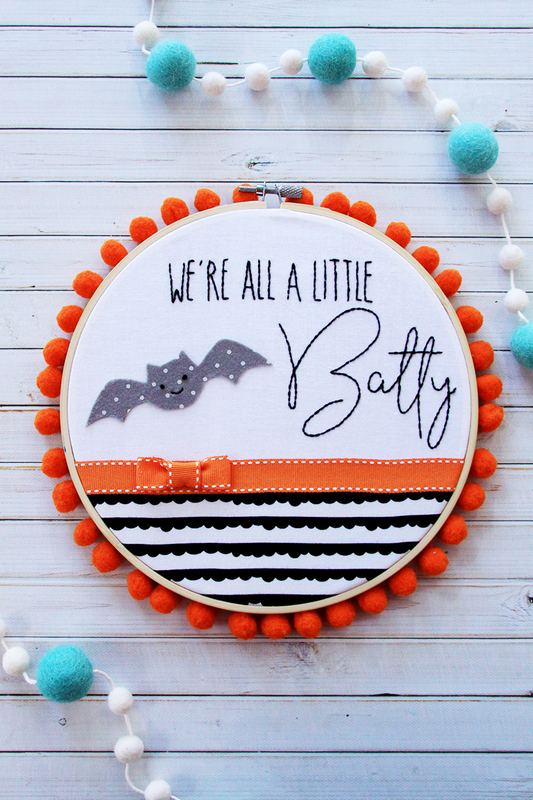 Stitch up this fun Halloween hoop to show your guests how welcome they are! 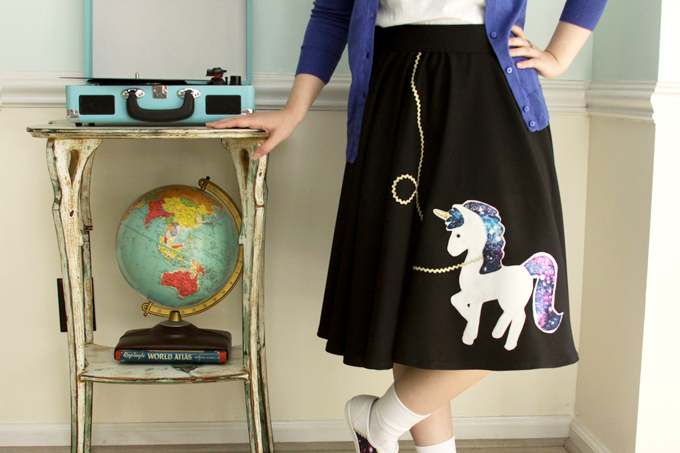 Take your fifties outfit out of this world with this fun Galaxy Unicorn skirt - and matching saddle shoes! Click VIEW MORE below for the PDF pattern. 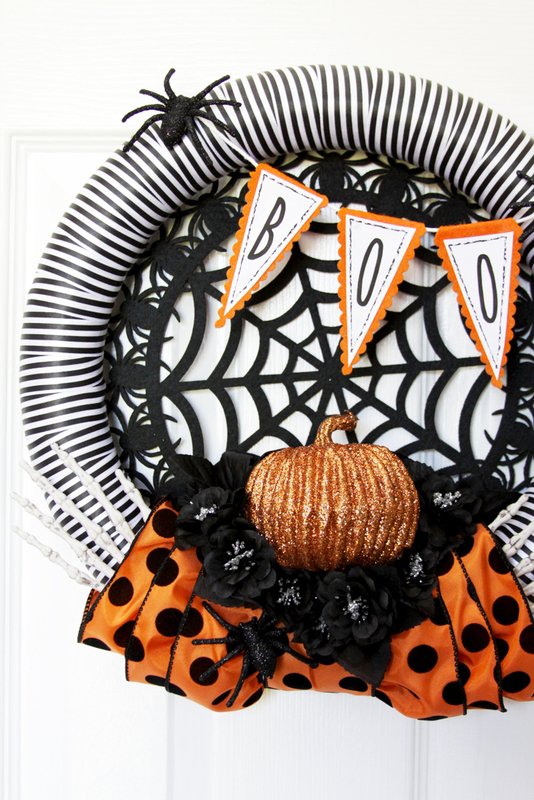 This Halloween banner is perfect with this spooky wreath. 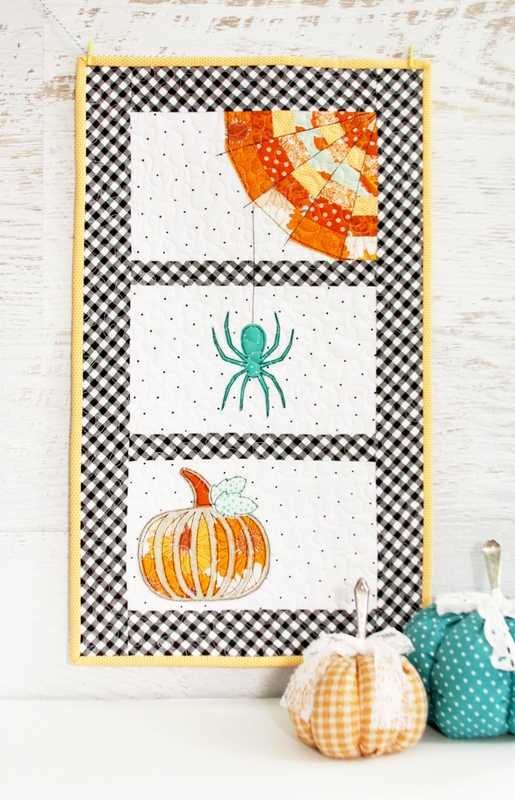 This cute Mini Quilt is the perfect little wall quilt or table topper Halloween decoration! 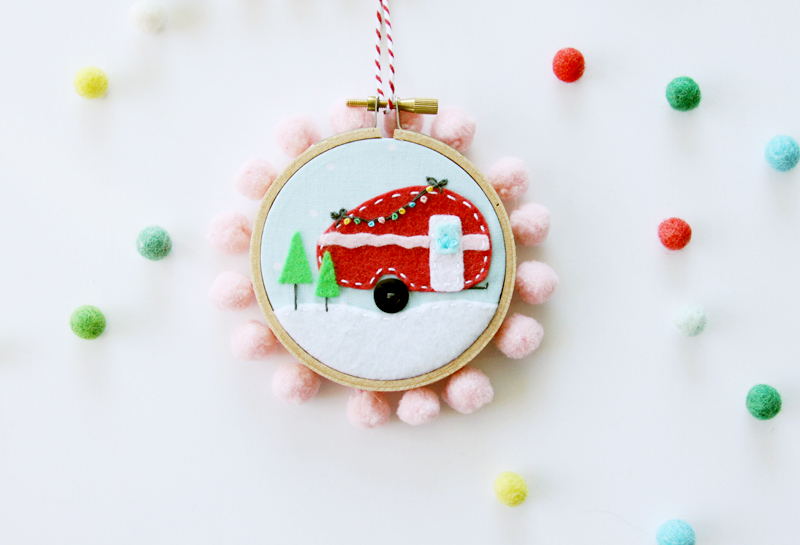 Make up these cute Snowglobe Ornaments for Christmas! 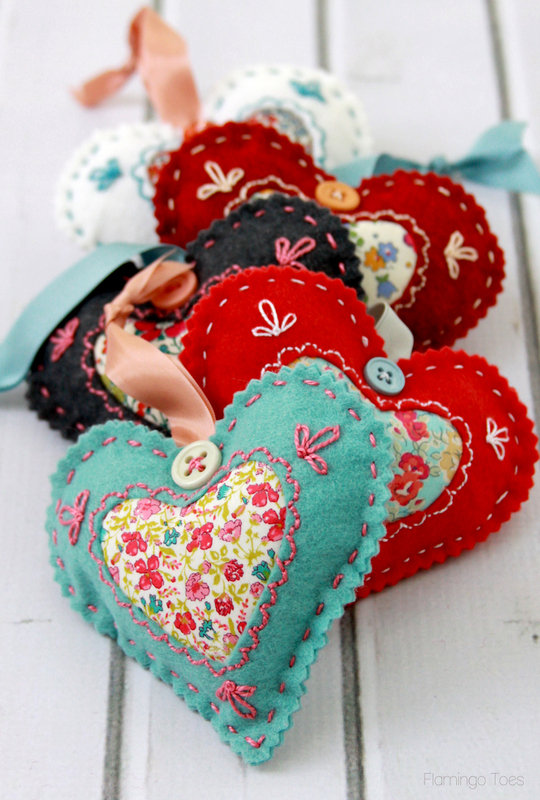 These are a great way to use up fabric scraps too! 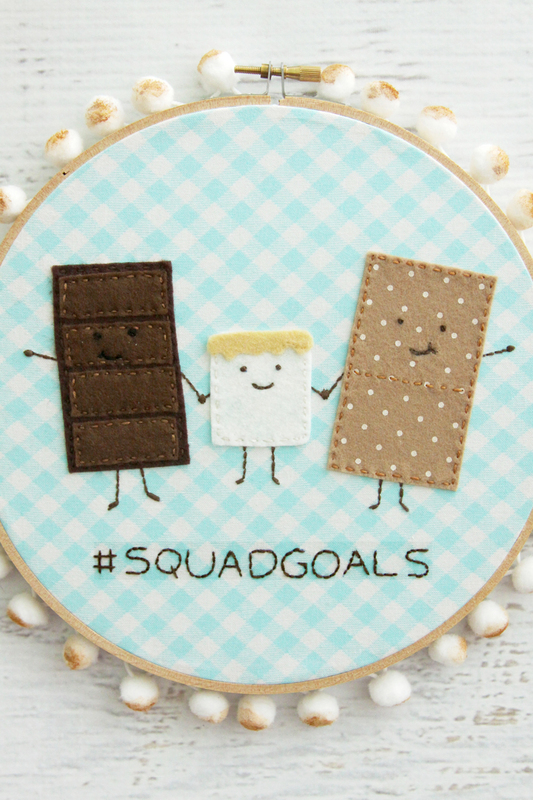 Show off your favorite summer dessert with this cute S'mores Embroidery Hoop Art! 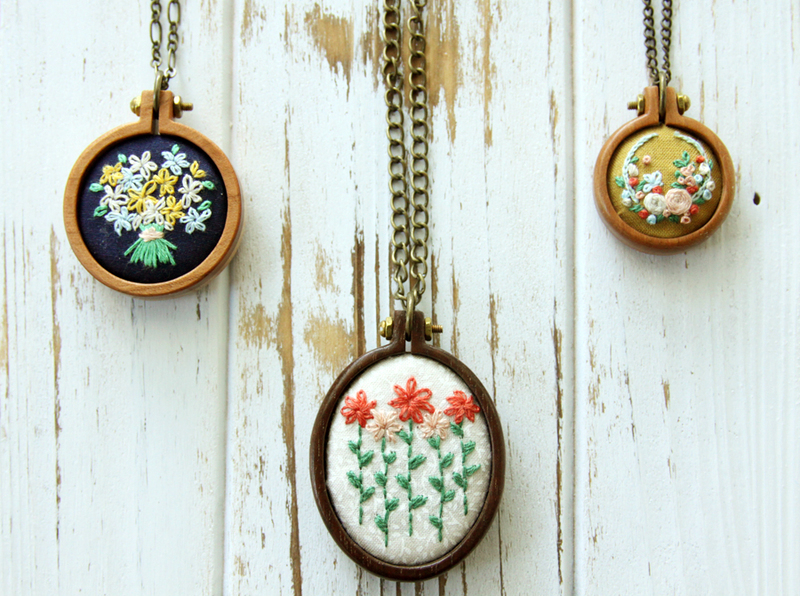 Show everyone your embroidery with these adorable mini embroidery hoop necklaces! 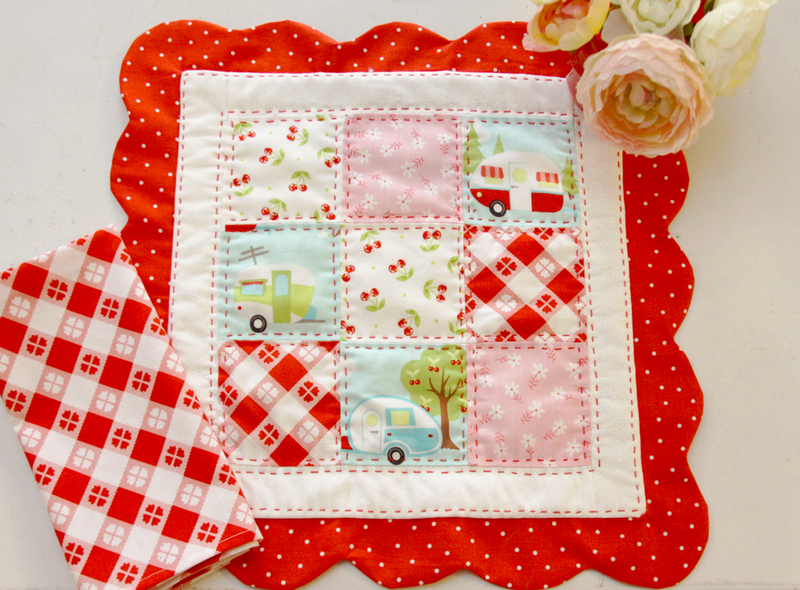 A great beginner project for sewing and quilting! 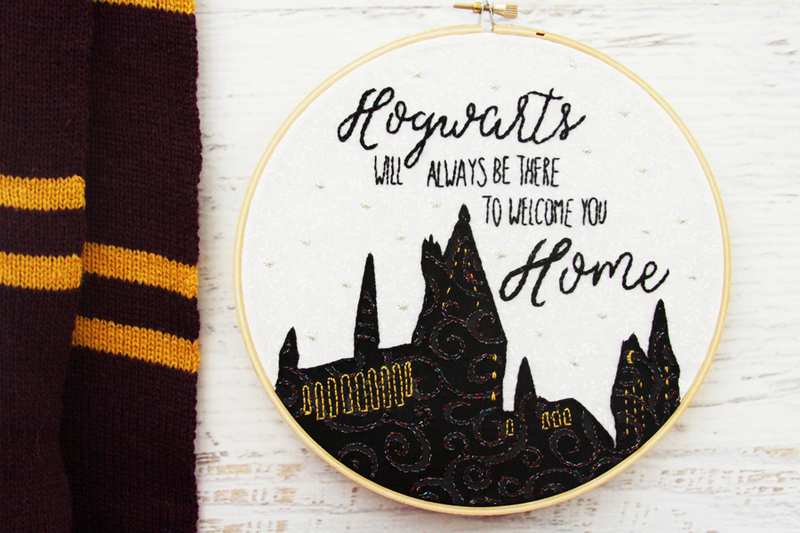 This magical hoop art is perfect for all Harry Potter lovers! 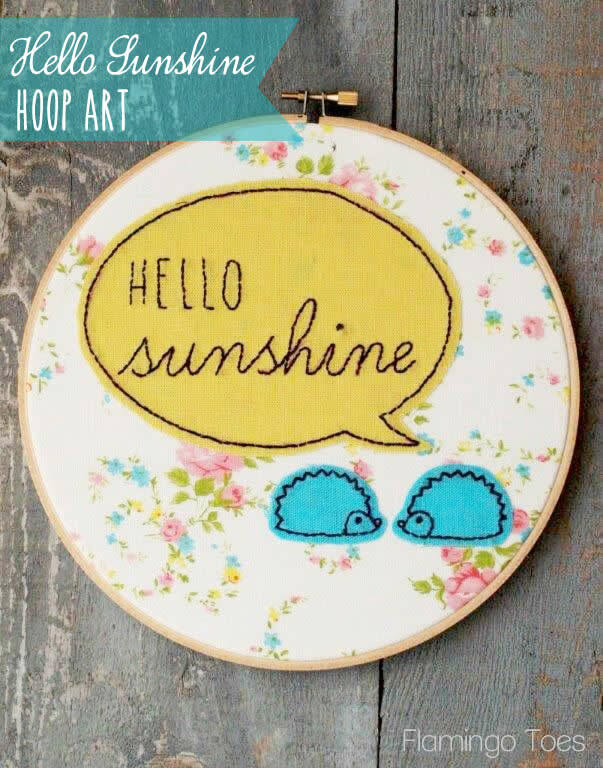 This hoop is a great way to combine art you love! This hoop within a hoop is so fun and unique! 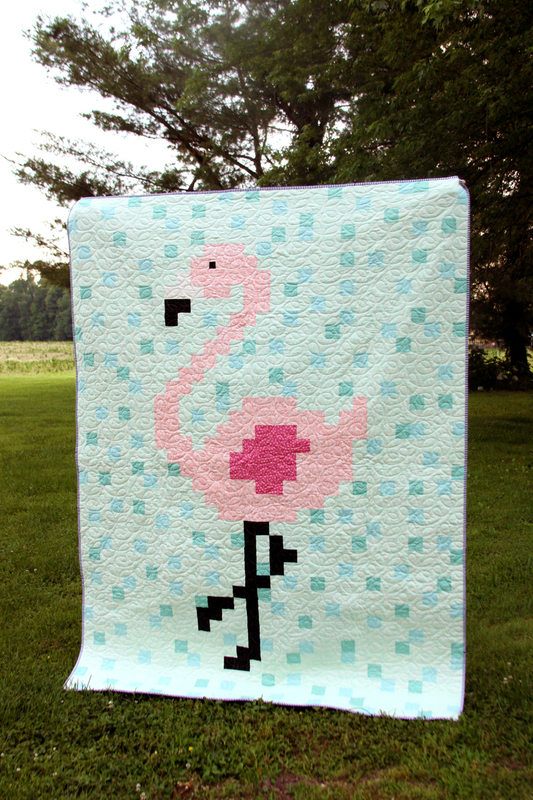 This cute flamingo quilt is a great Summer project! Click VIEW MORE below for the PDF pattern and tutorial. 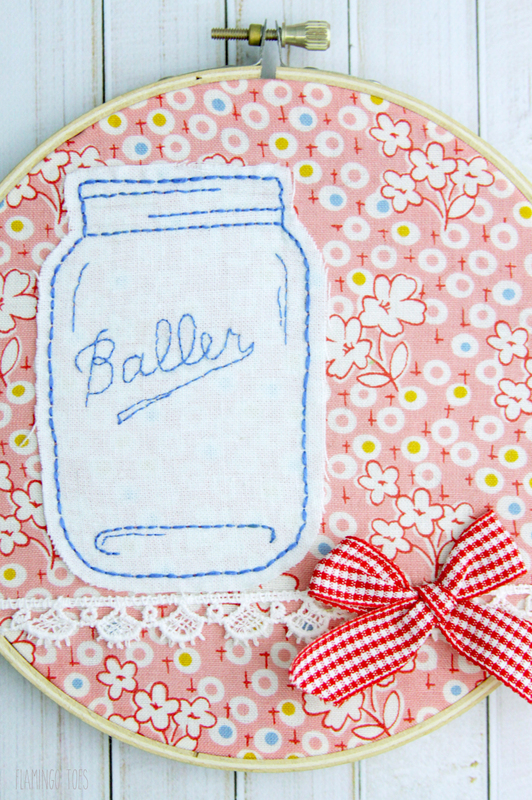 These placemats are so cute and great for scrapbusting! 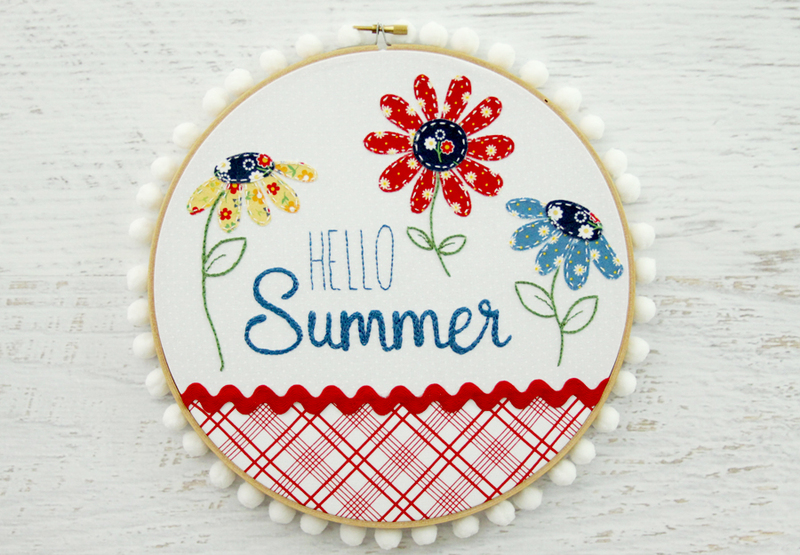 This cute Summer hoop uses embroidery and fabric, and is so fun to make! 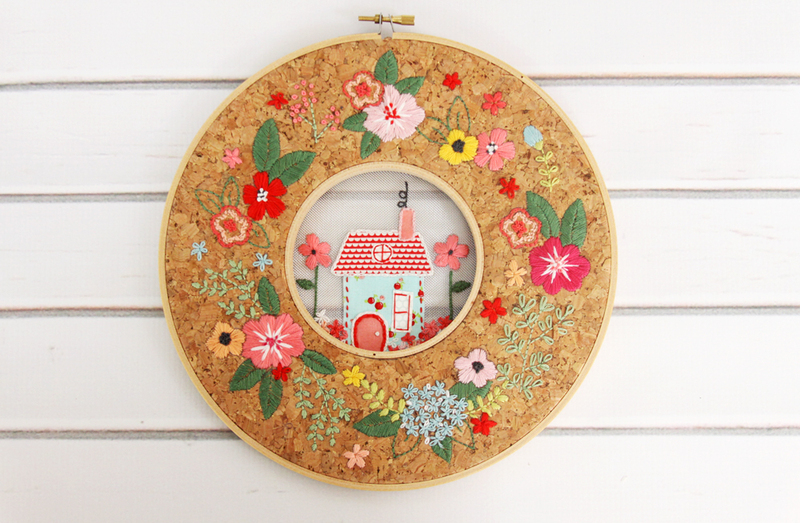 Cute, retro, Summer hoop. So easy and fun to make! 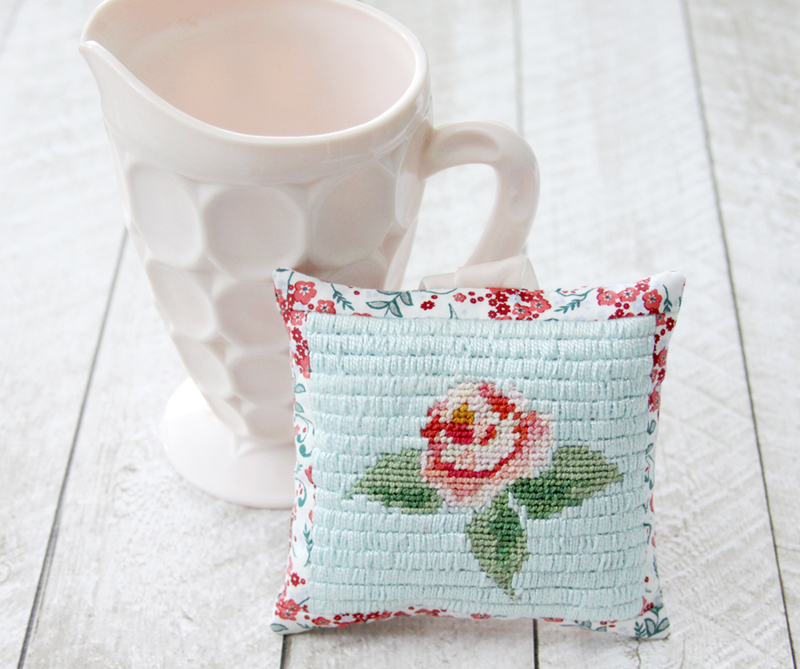 Cute and easy to make rose needlepoint sachet. 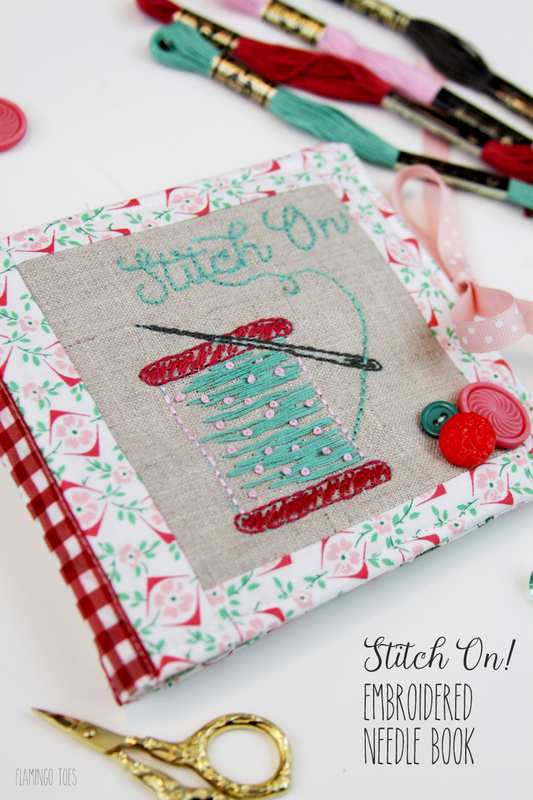 This is a great beginner needlepoint project! 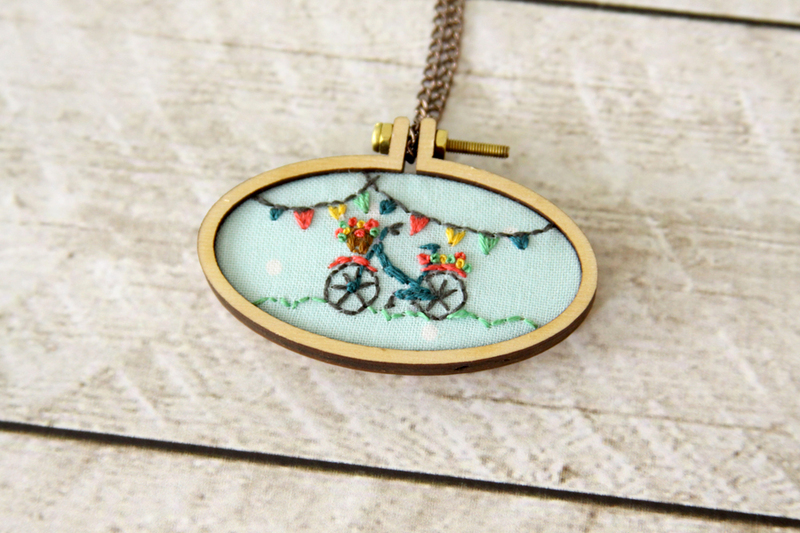 This hoop necklace is so cute and tiny! 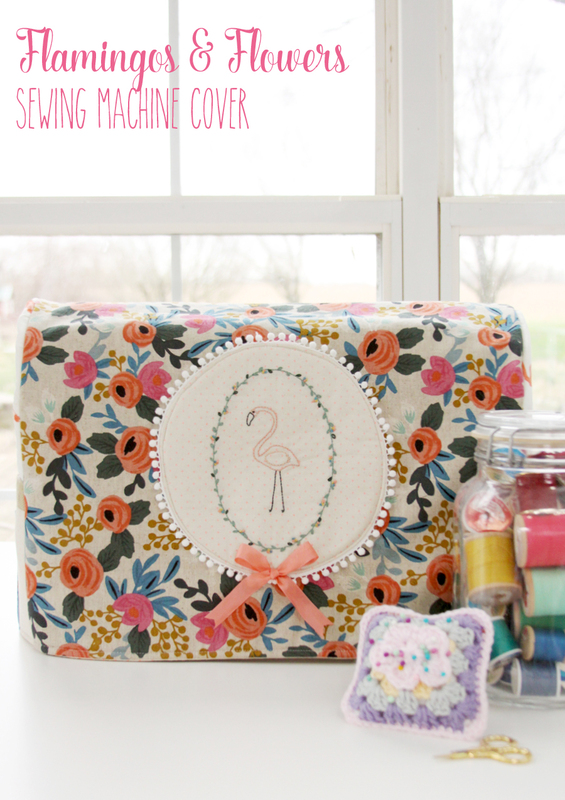 Tutorial and pattern for this pretty, floral sewing machine cover. 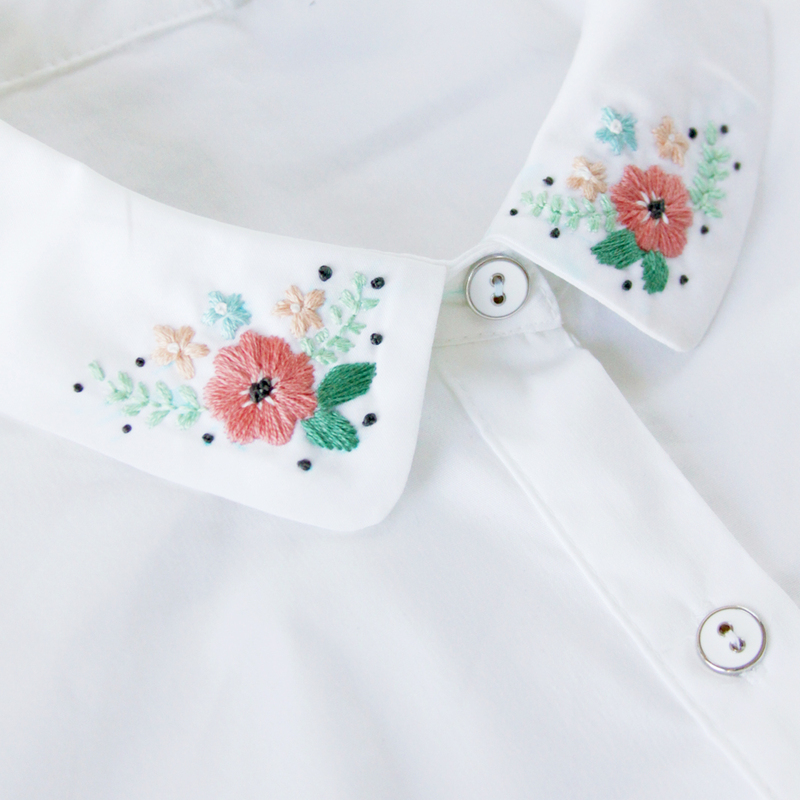 This embroidered collar is a great way to bring new life to a plain or old shirt! 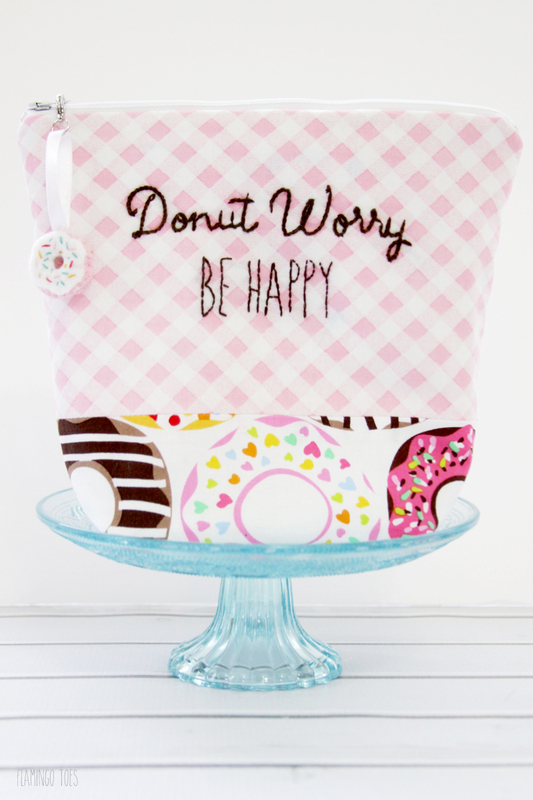 This sweet hoop is so fun to make and is perfect for beginners! 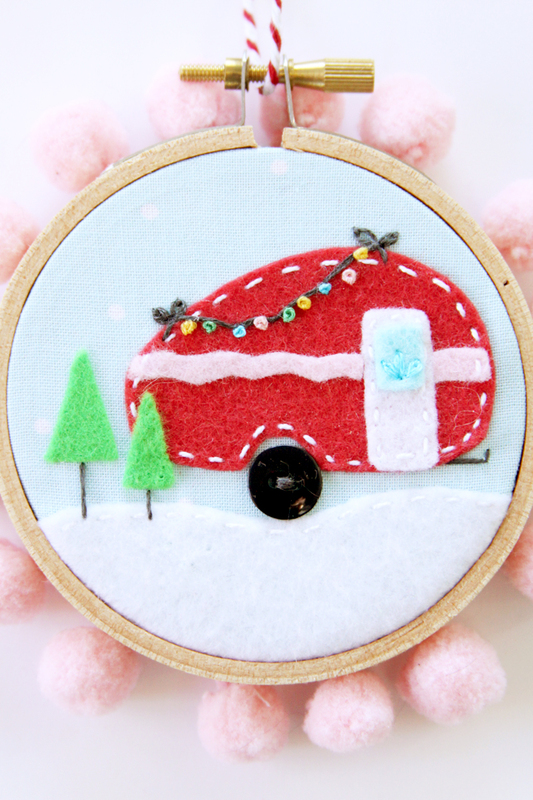 This cute felt hoop art is so easy to make! 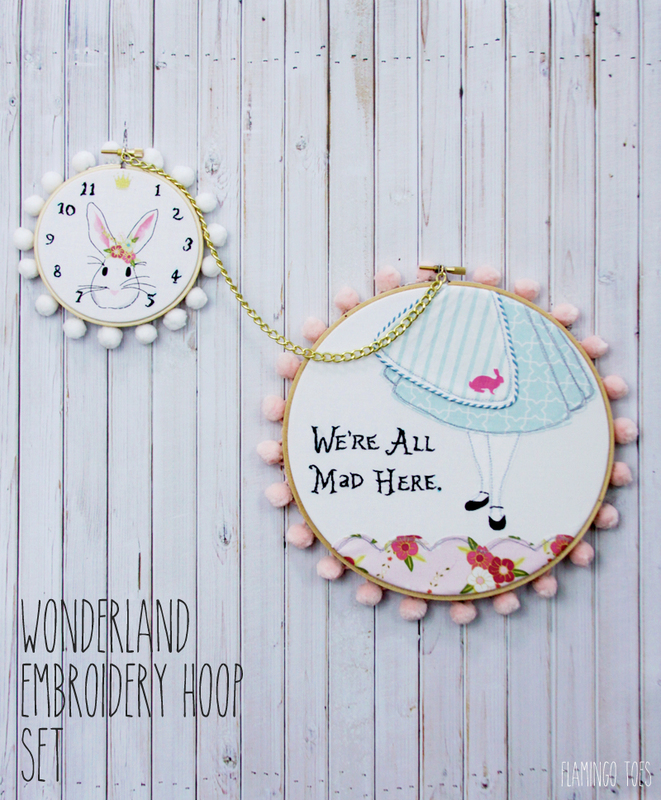 This fun Alice in Wonderland inspired hoop set is so easy and fun to make! 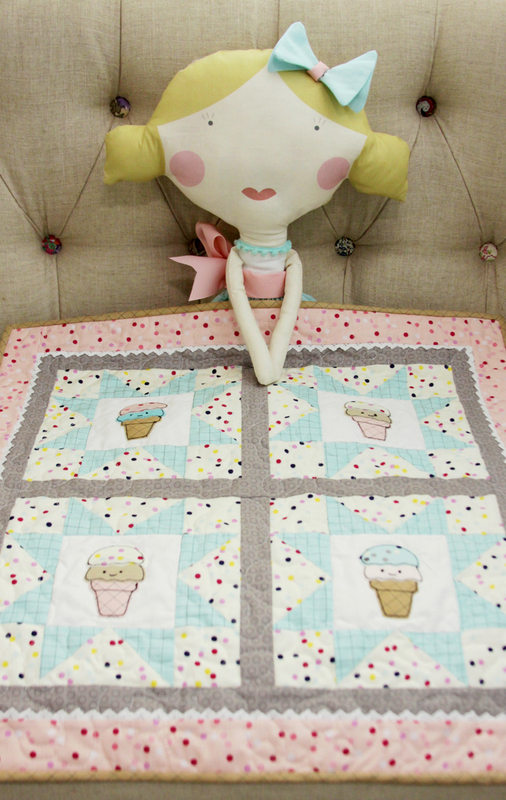 This super cute baby quilt is the perfect gift for a new baby! 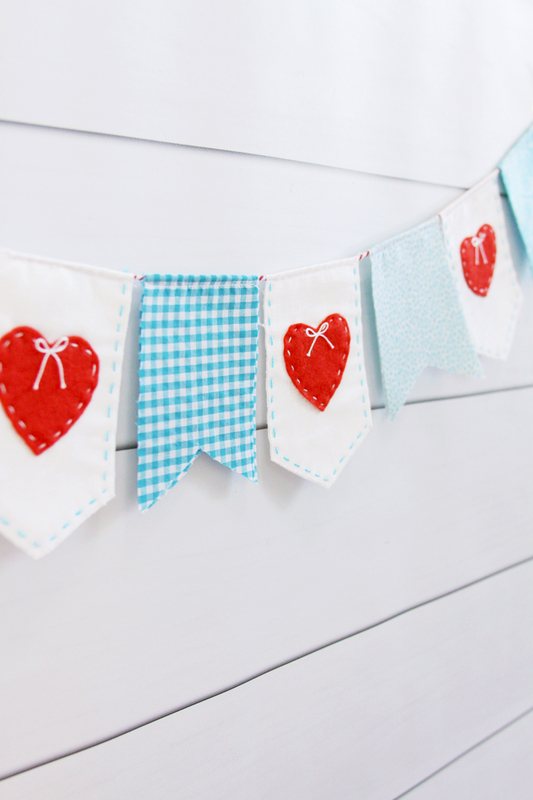 This cute decoration is great for Valentine's Day! 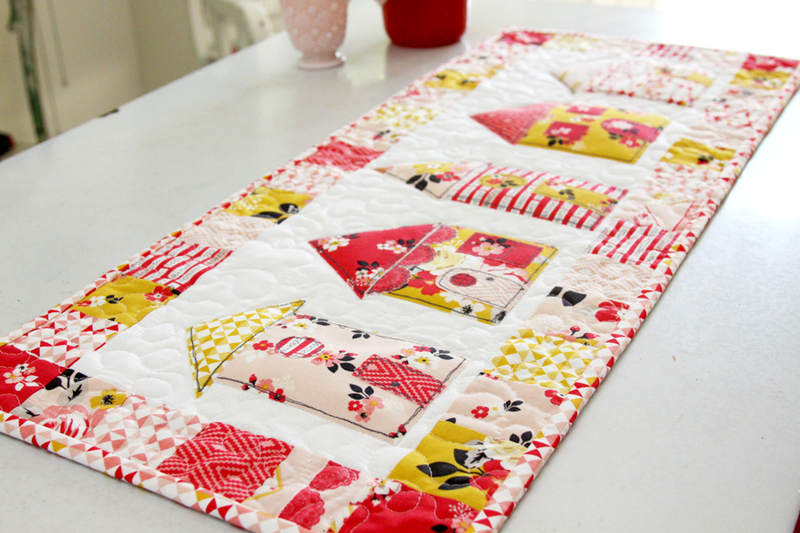 Free Tutorial and Pattern for this fun Sewing Quilt! 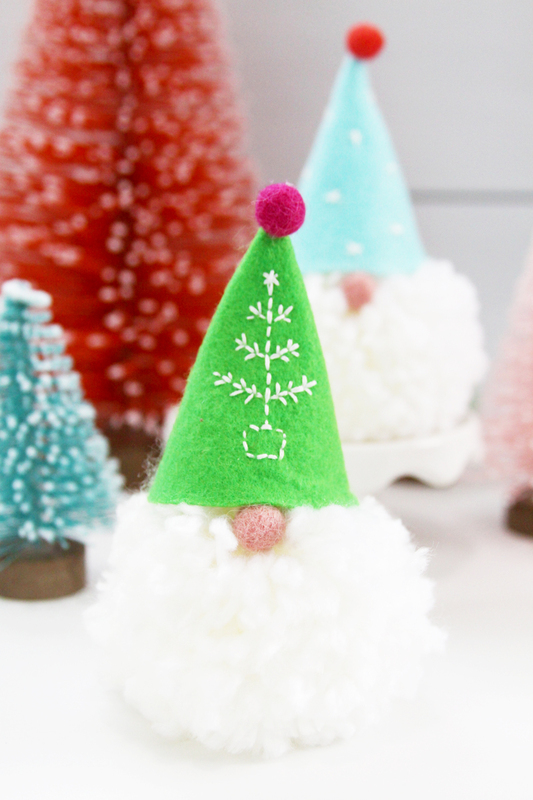 Pattern for these adorable hats to go with these great gnome ornaments. Find the tutorial for the gnome ornaments at Tatertots and Jello. Click VIEW MORE below for the PDF pattern. 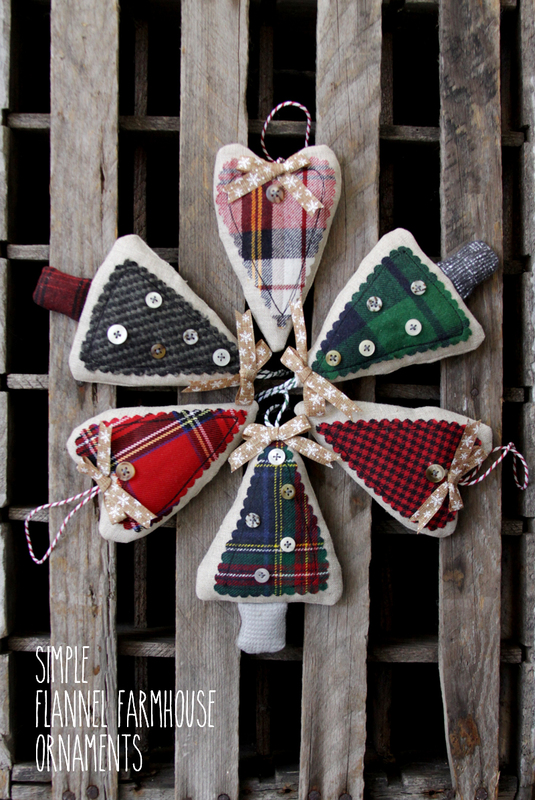 These cute flannel ornaments are so easy to make. 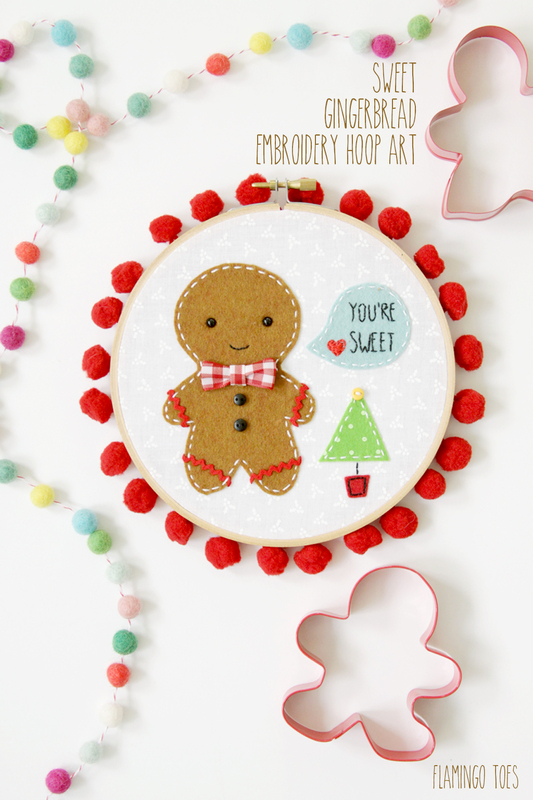 Tutorial and pattern for this great gingerbread hoop art! You can find the tutorial at iheartnaptime.net. 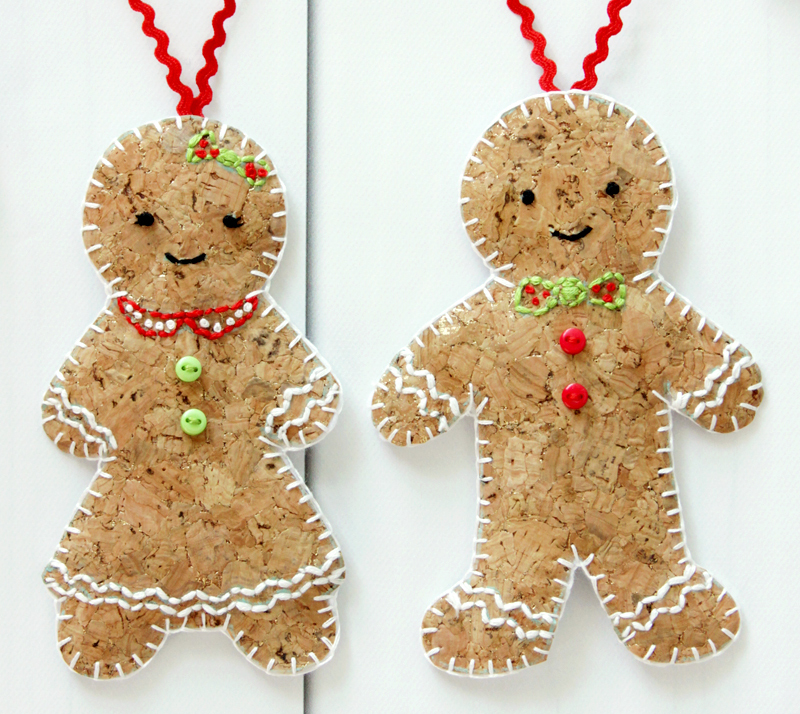 These cute gingerbread ornaments are great for the tree or gift toppers! 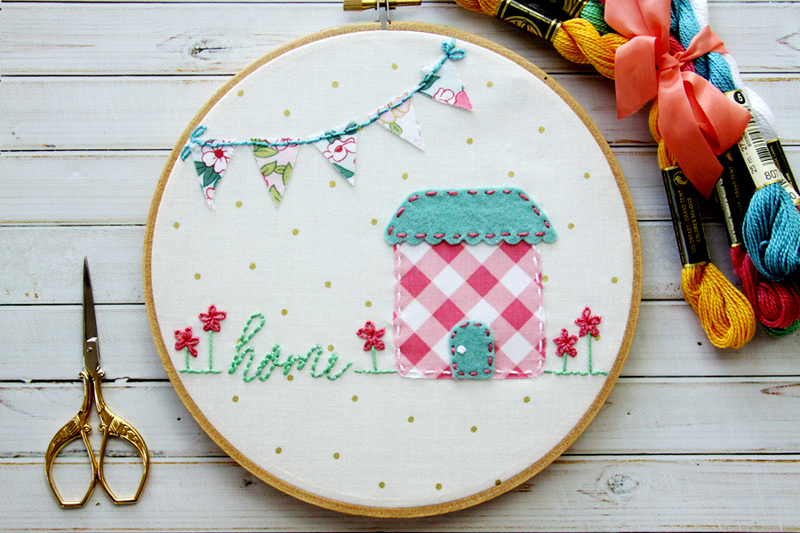 This embroidery hoop is so cute as wall decor or as a gift! 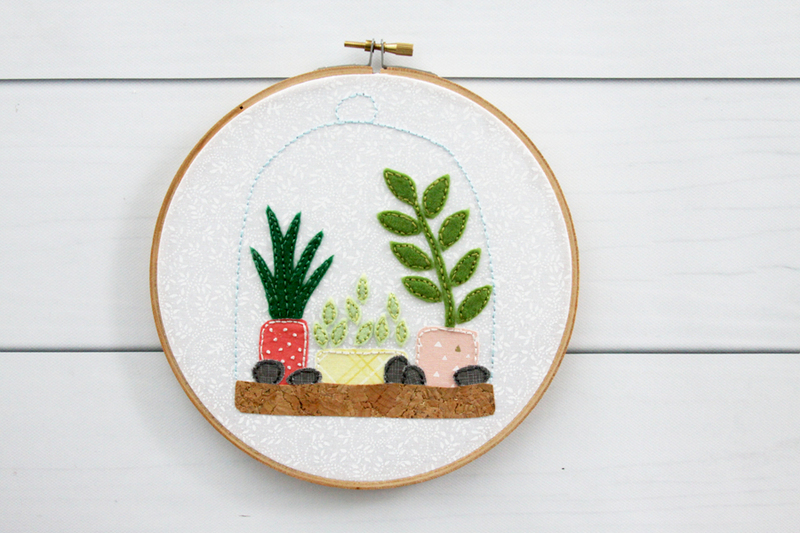 This embroidery artwork is so quick and easy to do! 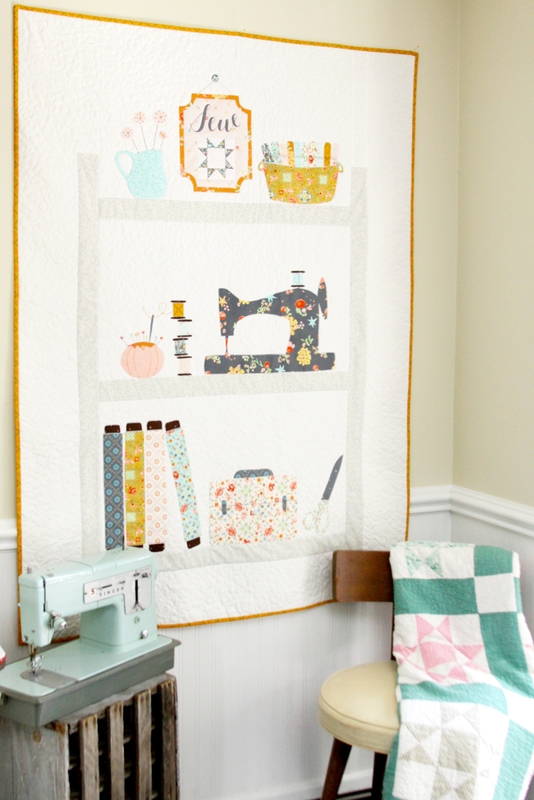 This mini quilt is so great as wall art or as a doll quilt! 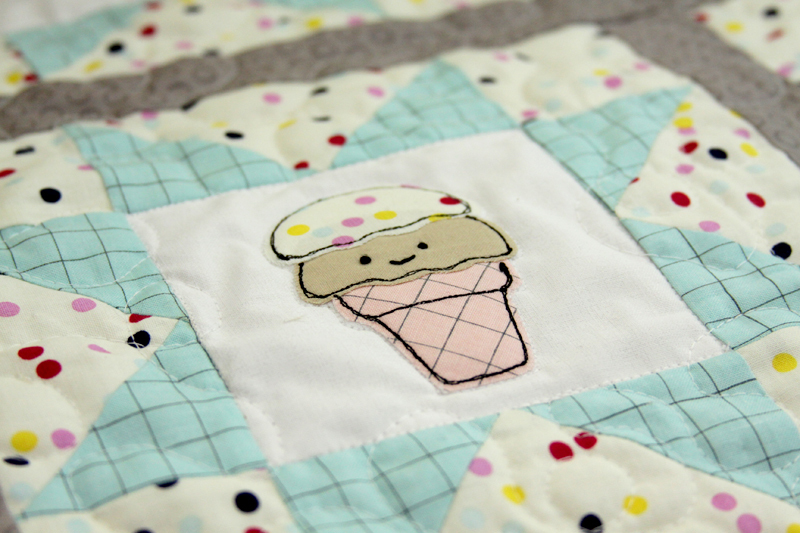 This cute ice cream cone is great for any embroidery project! Colorful candy corn pillow great for Halloween or Fall. 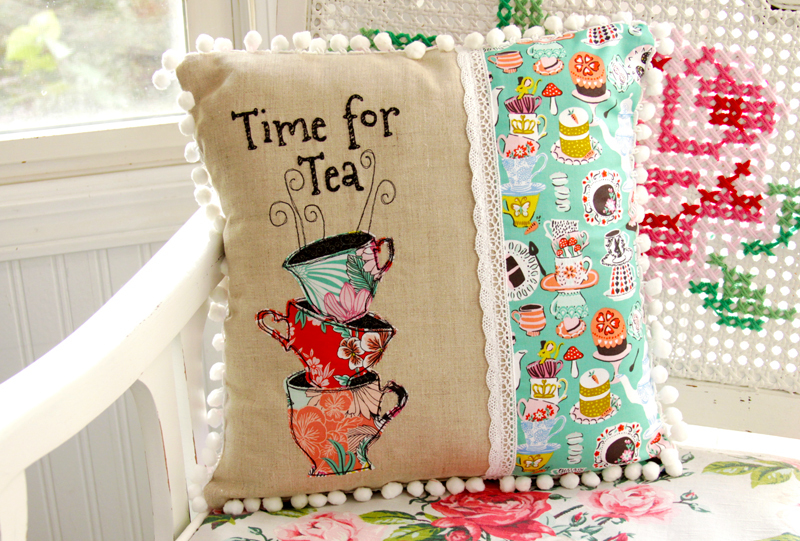 This is a great pillow if you love Tea or Alice in Wonderland! 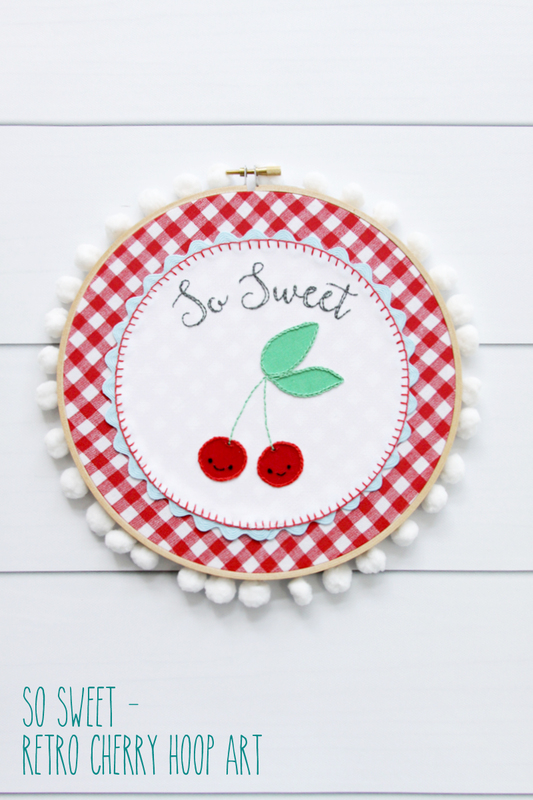 This cute, retro hoop art is perfect for summer! 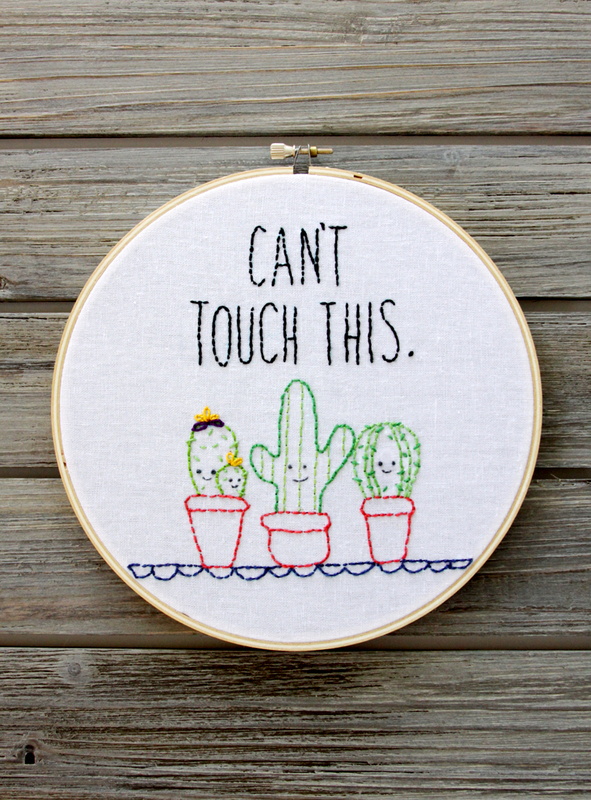 Fun Cactus Embroidery Hoop - perfect for beginners! 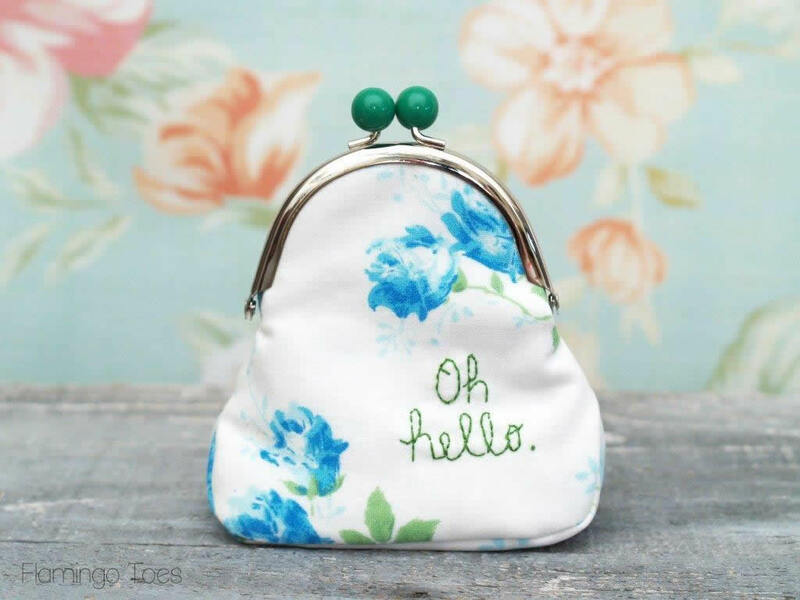 This cute pouch is so great for keeping track of those easy to lose earbuds. 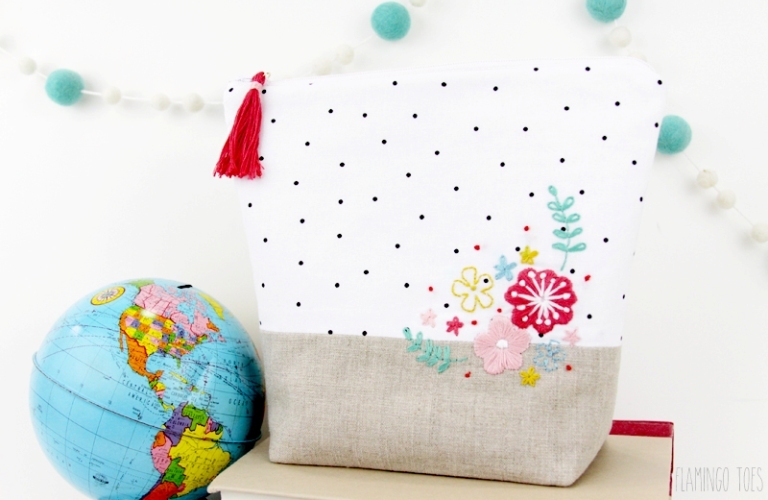 This zipper pouch is so cute, and fun to make! 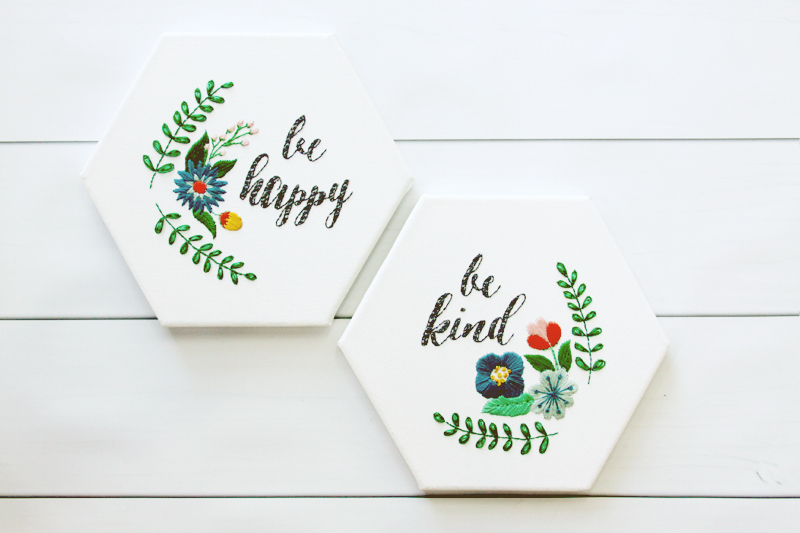 These hexagons are so unique and cheerful! 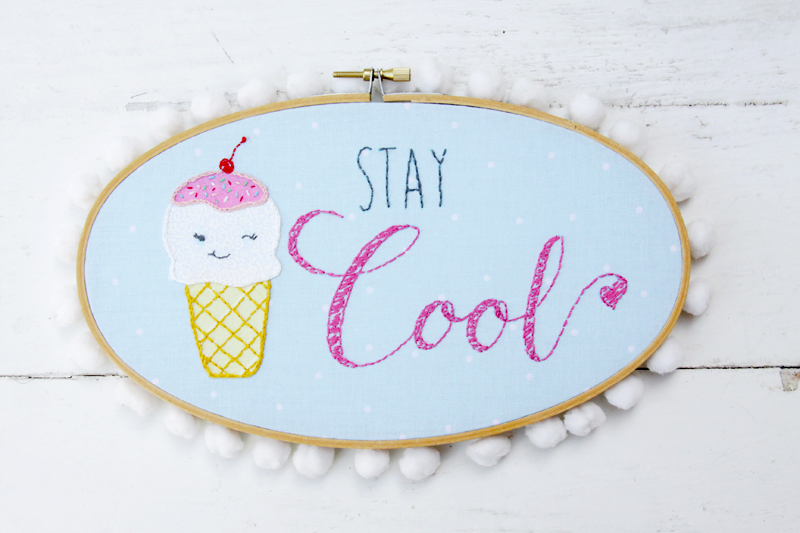 Cute Ice Cream Embroidery Hoop - Perfect for Summer! 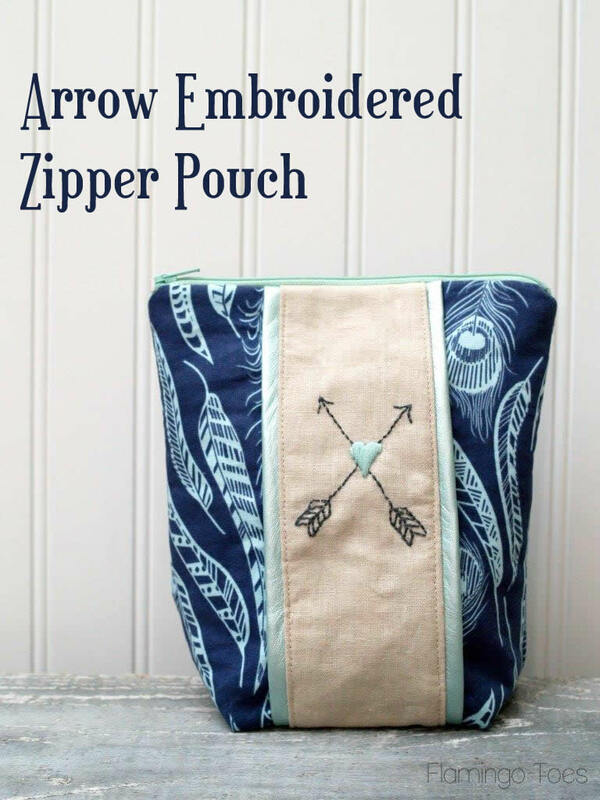 Tutorial and pattern for this sweet zipper pouch! 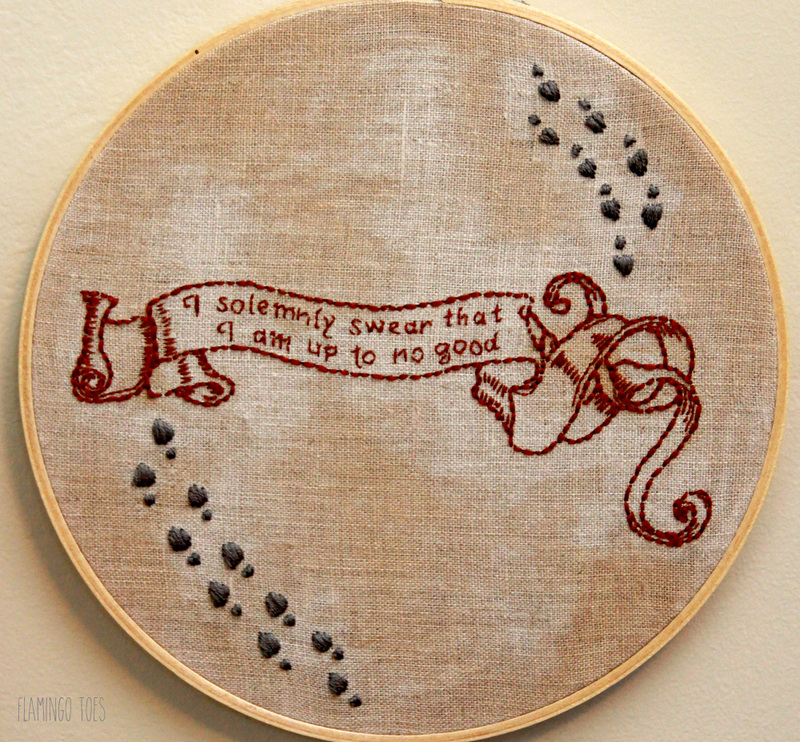 This hoop is so cute and quirky - perfect for any Harry Potter lover! 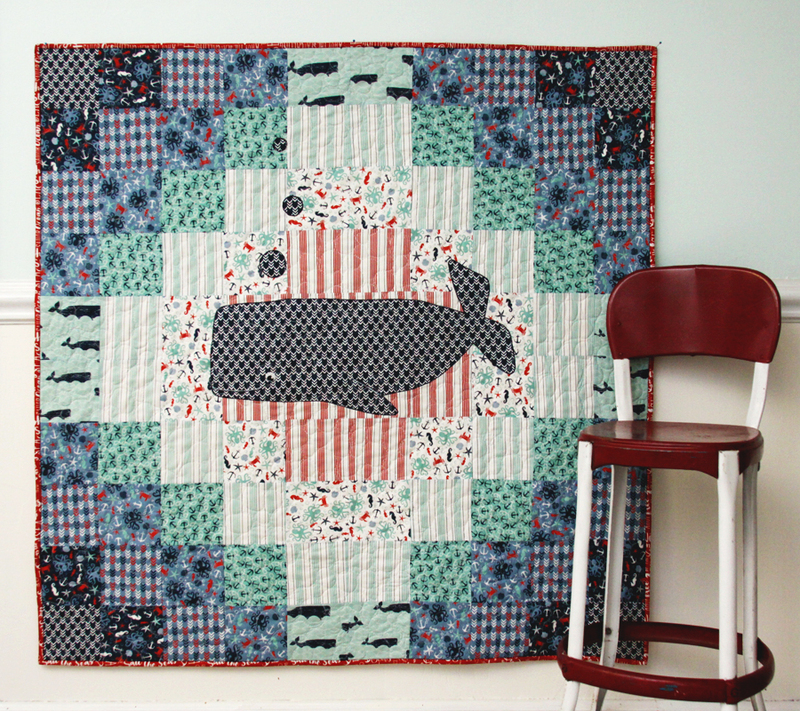 Free tutorial and pattern for this fun map quilt. Click the link to download the pattern. *Bonus-Free pattern for Canada now available also. 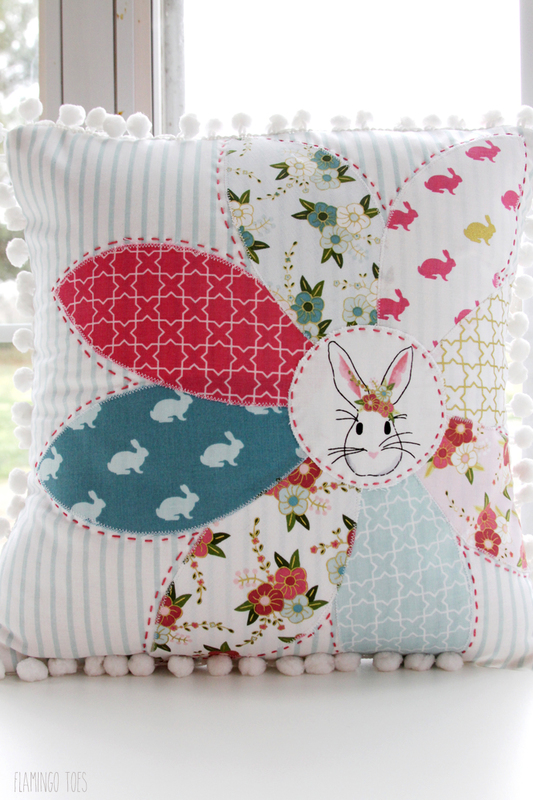 Free tutorial and pattern for this great pillow for any time of the year. 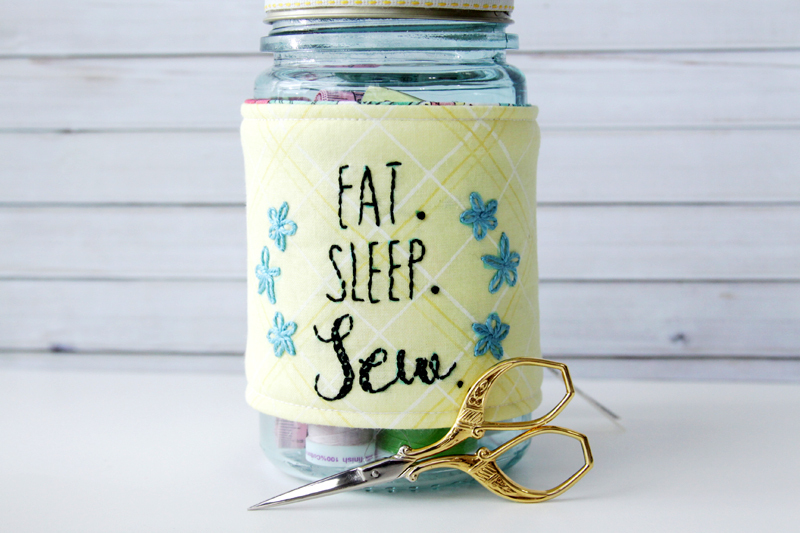 This cute mason jar cozy can be used for many things, such as a drink cozy! 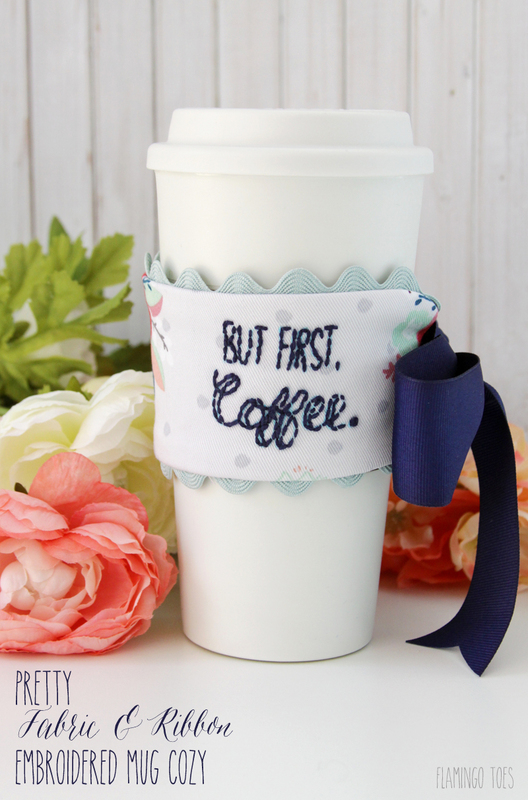 Cute ribbon and fabric mug cozy! 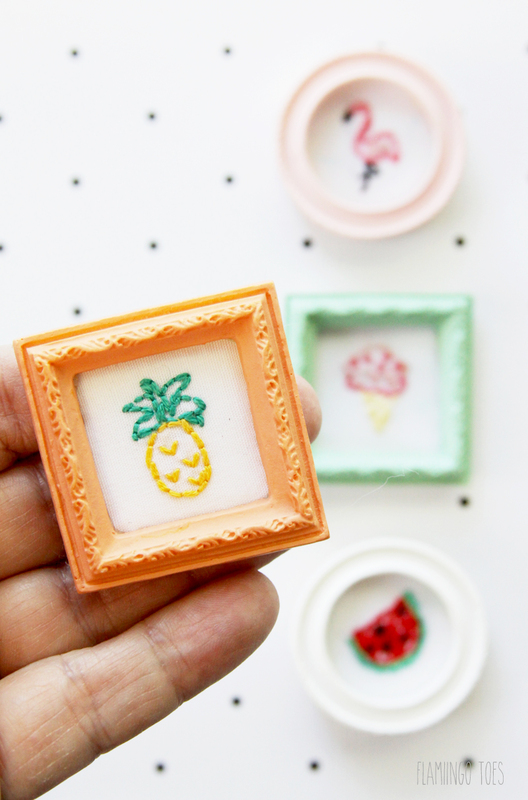 These mini embroideries are so adorable! 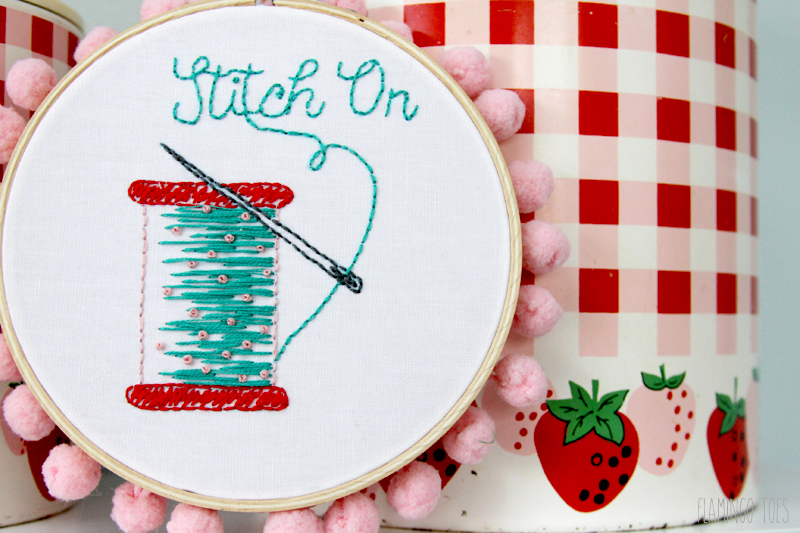 This hoop is such an easy and fun beginner project! 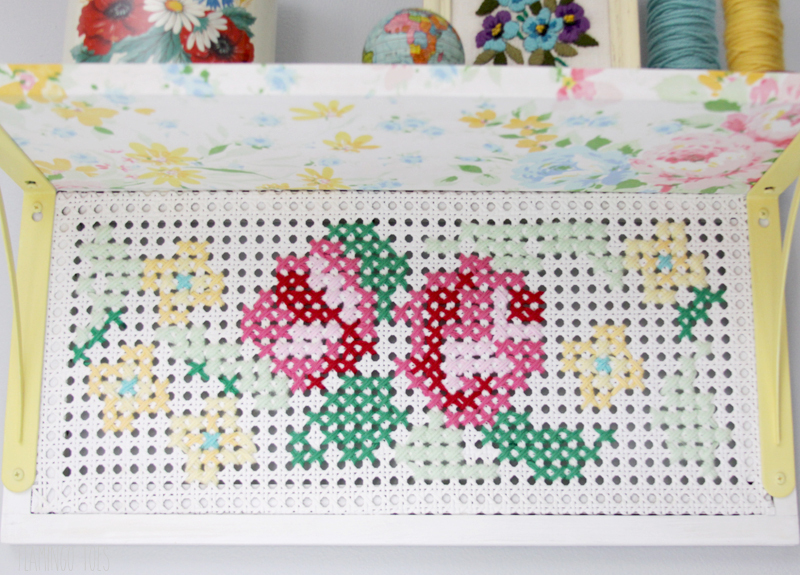 This pretty Spring table runner is so easy to make! 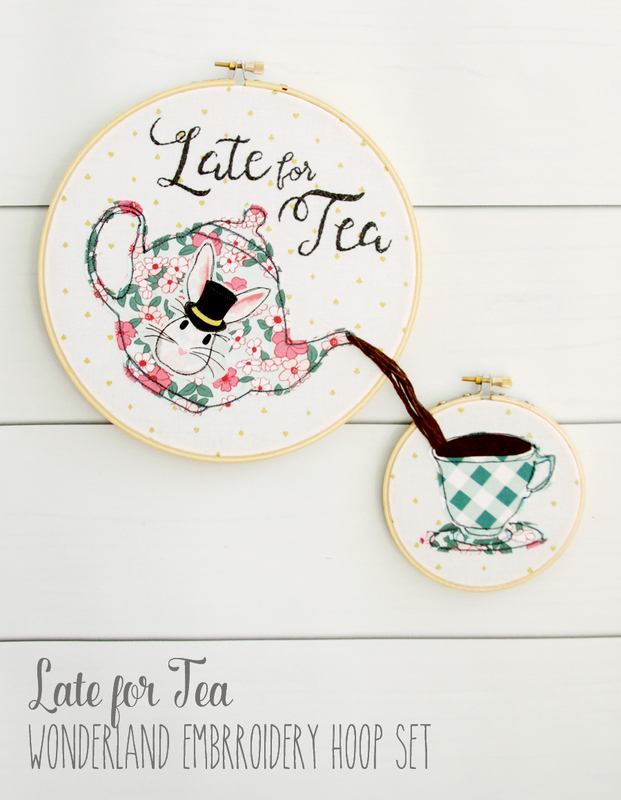 These Alice in Wonderland hoops are so fun to make! These potholders are so colorful and easy to make! 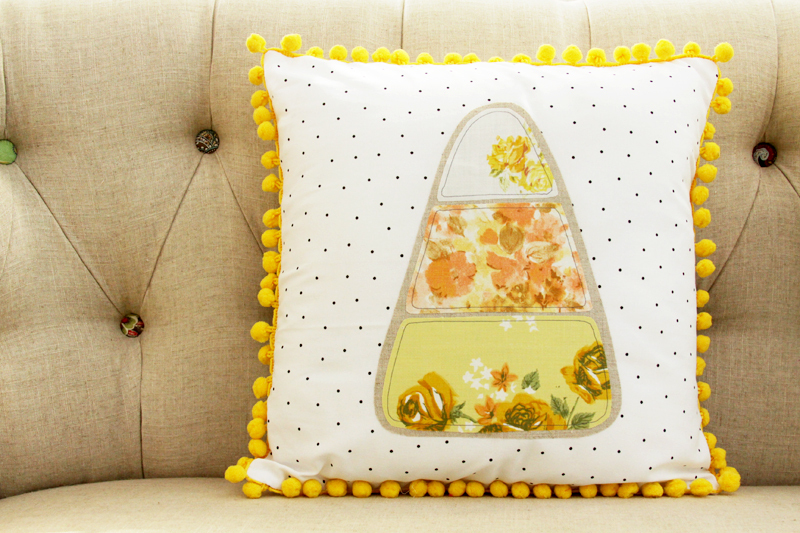 This Spring pillow is so sweet! 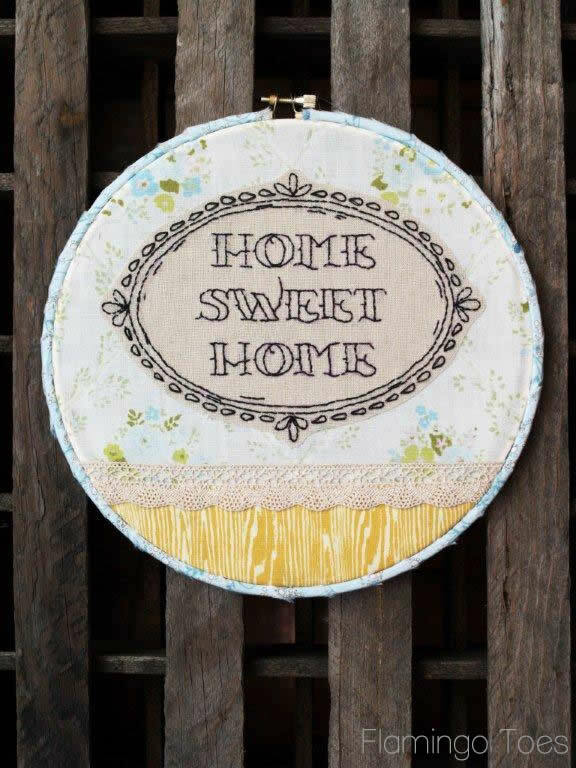 This pretty hoop art is a great beginner project! 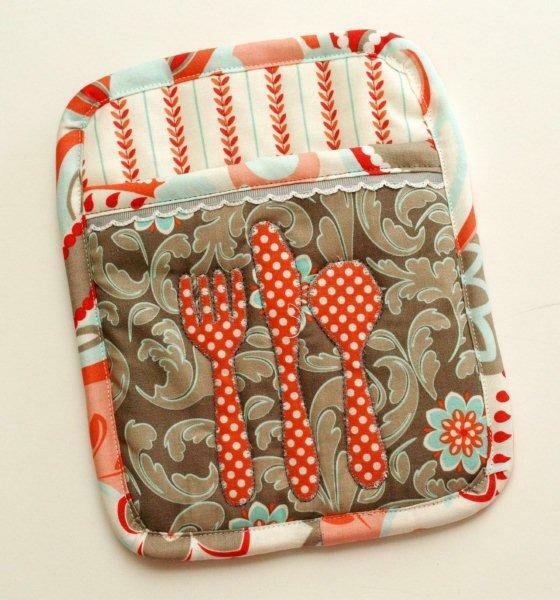 This yummy zipper pouch is so fun to make! 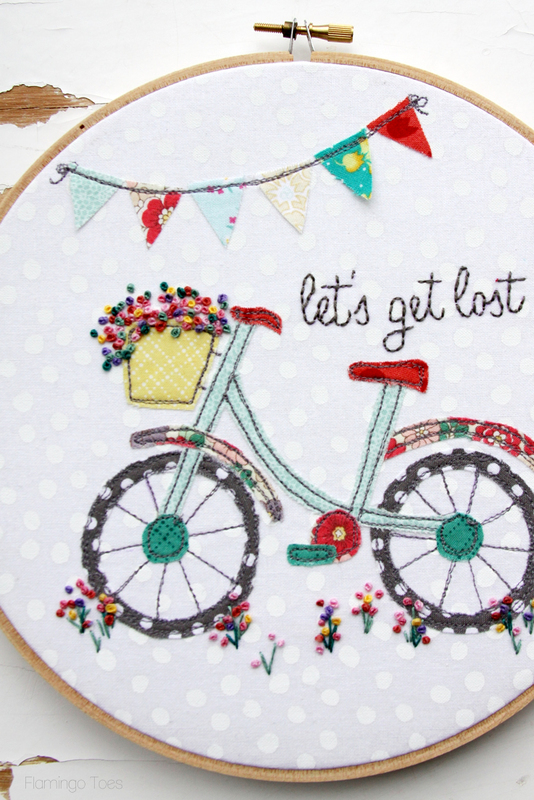 Cute cross stitch project that is both decorative and functional. 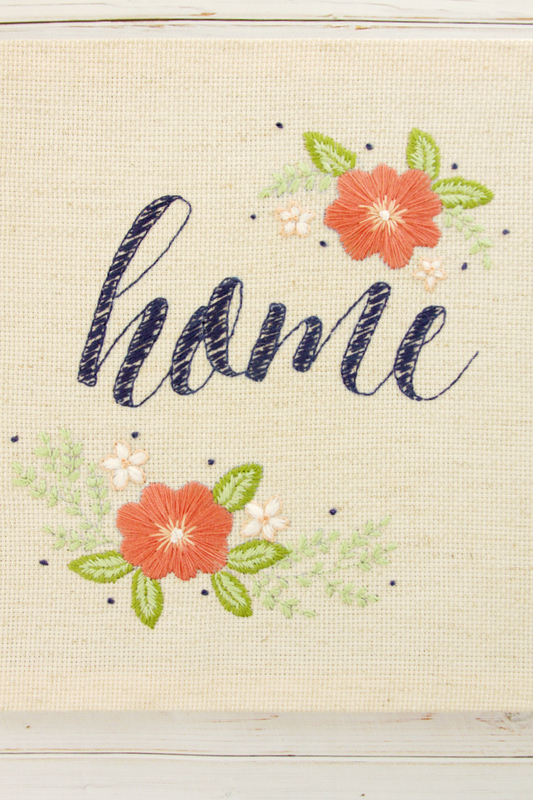 This floral embroidery is so pretty on this zipper pouch! 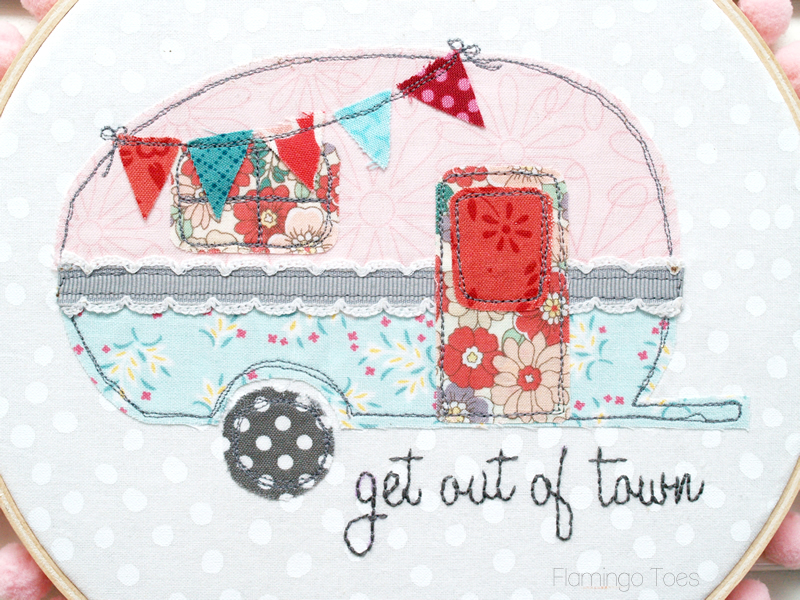 A great project for all those who like to sew or embroidery on the go! 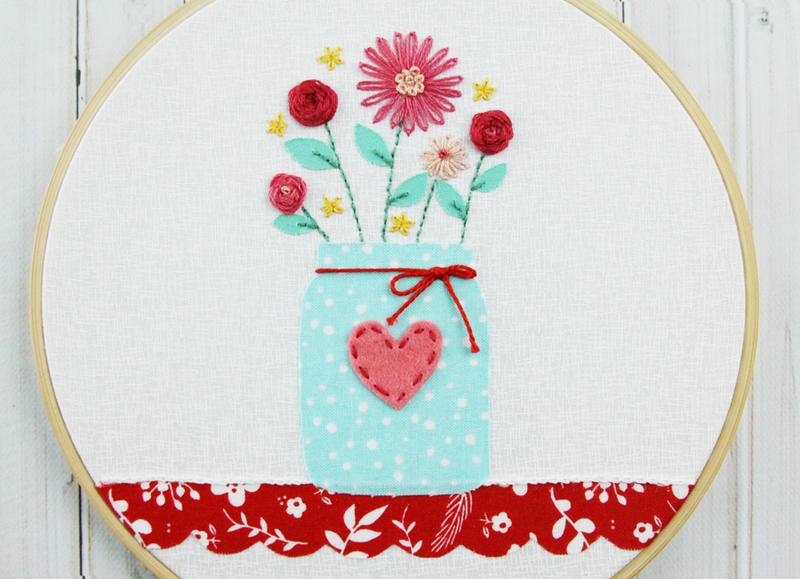 Cute and easy embroidery hoop art! A fun and easy project for beginners! 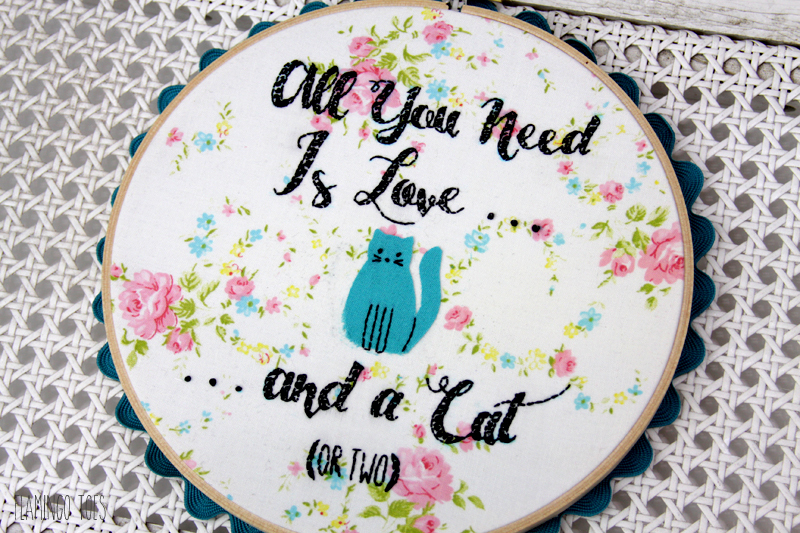 Hoop art perfect for cat lovers! 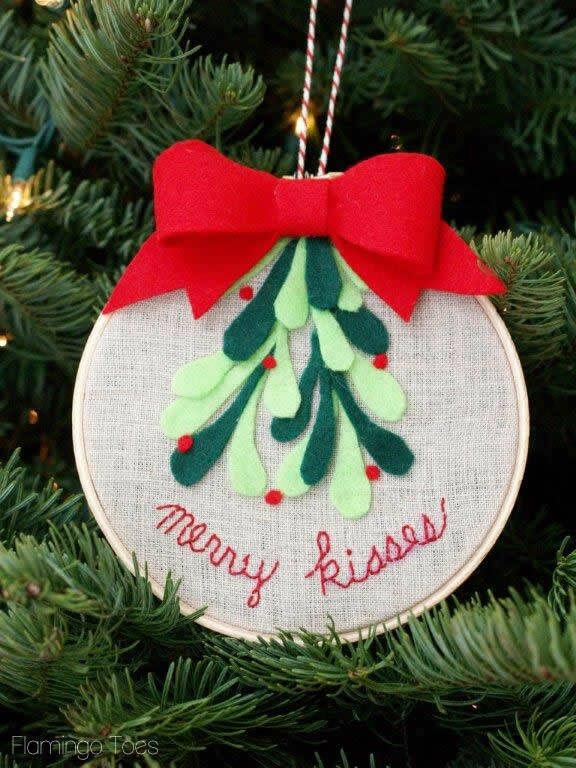 This Christmas hoop is so fun and easy to make! 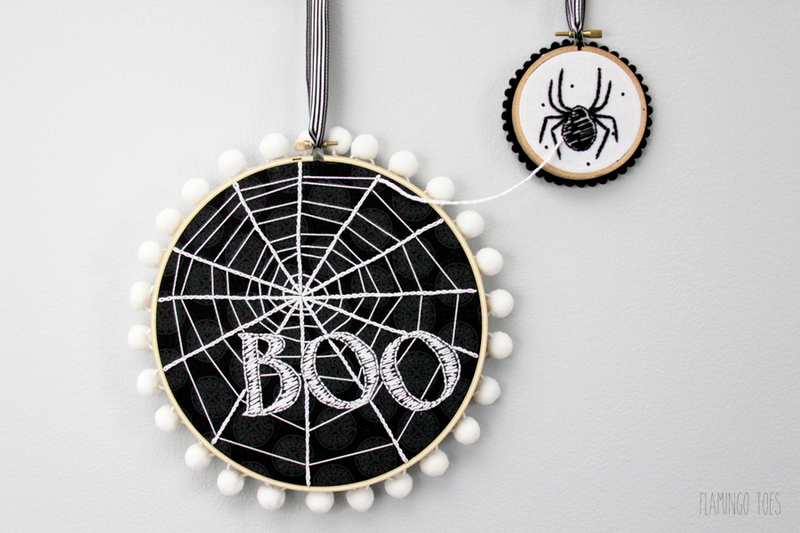 Tutorial and pattern for these spooky hoops. 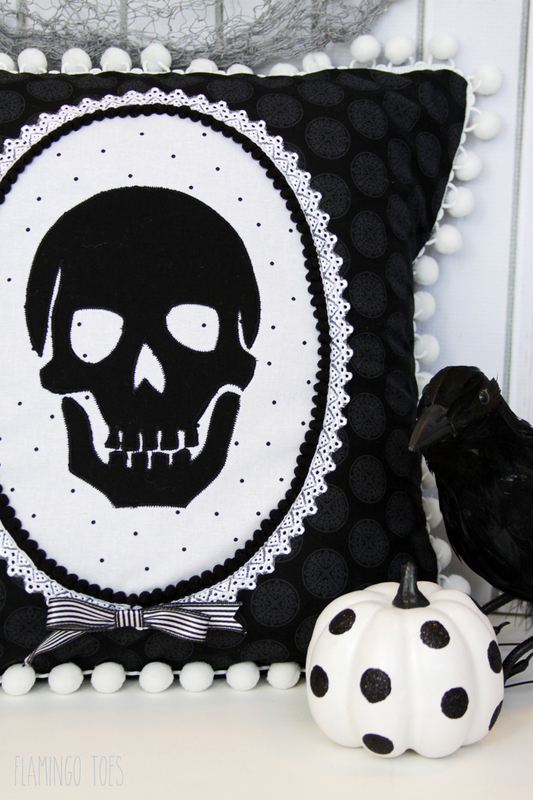 Celebrate vintage and Halloween with this spooky skeleton pillow! 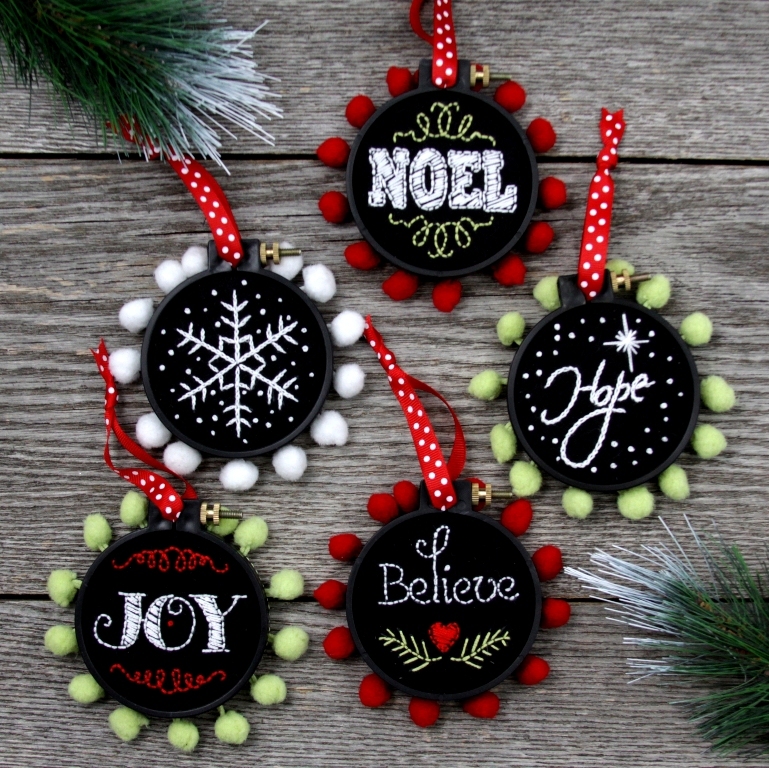 Pattern for these pretty ornaments that can go on the tree or be given as gifts. 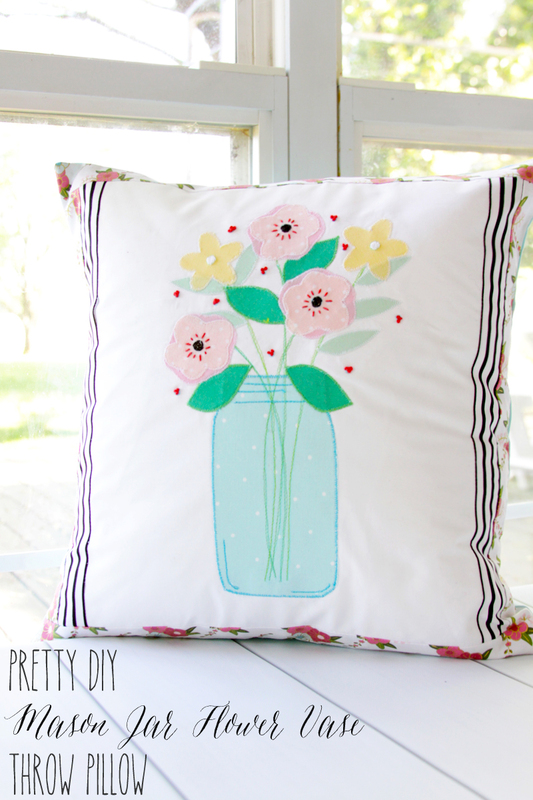 This lovely pillow is great for any home! Mischief managed! This hoop is great for all those Marauders out there. 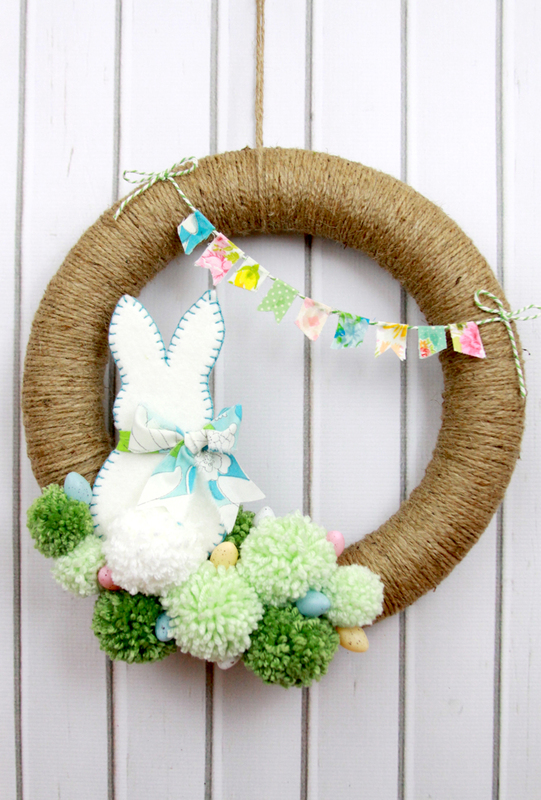 Tutorial and pattern for this festive Spring wreath and bunny. 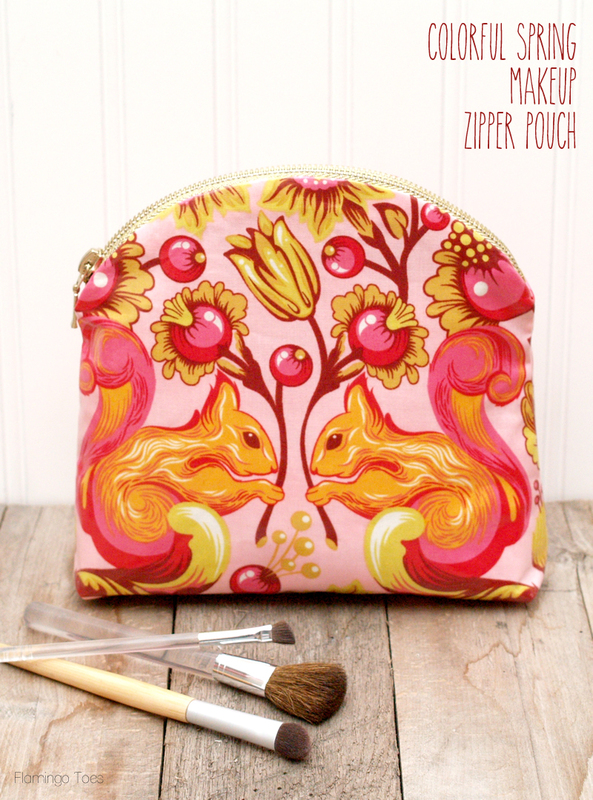 Use this cute deer pattern to make a fun zipper pouch! 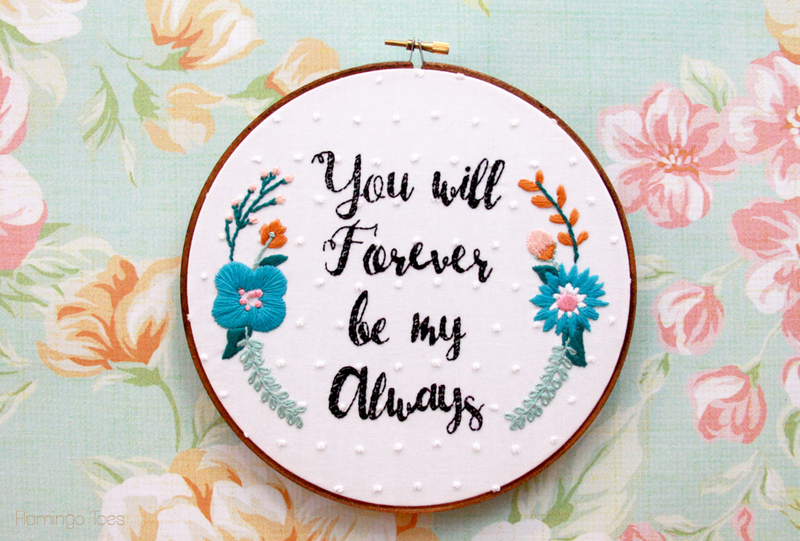 This pretty hoop is a great Valentine's Day gift! 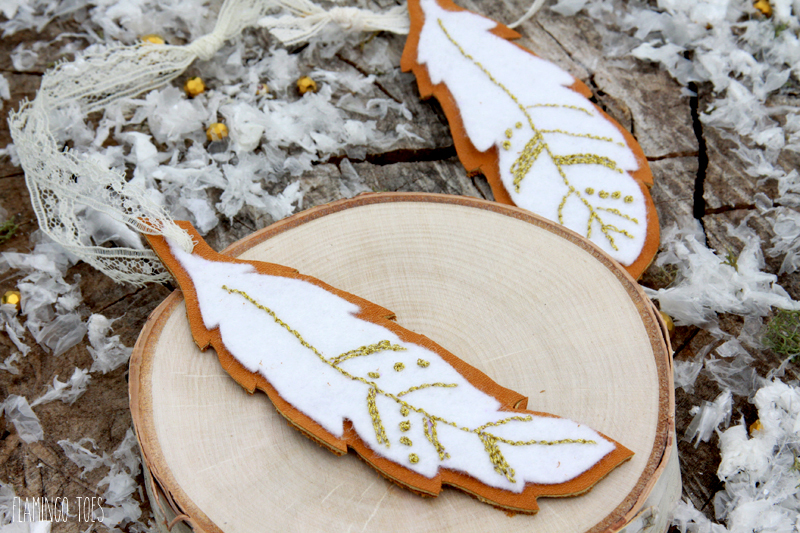 These ornaments are quick and easy and great for the Holidays. 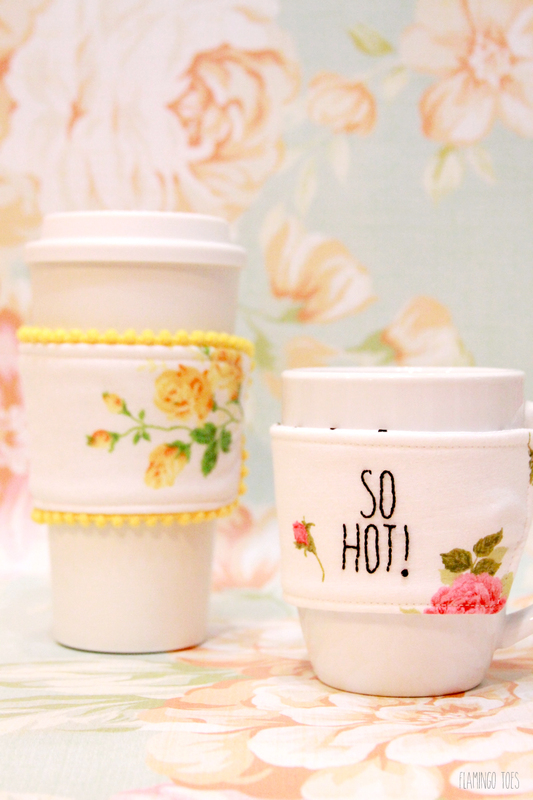 These mug cozies are great gift ideas! 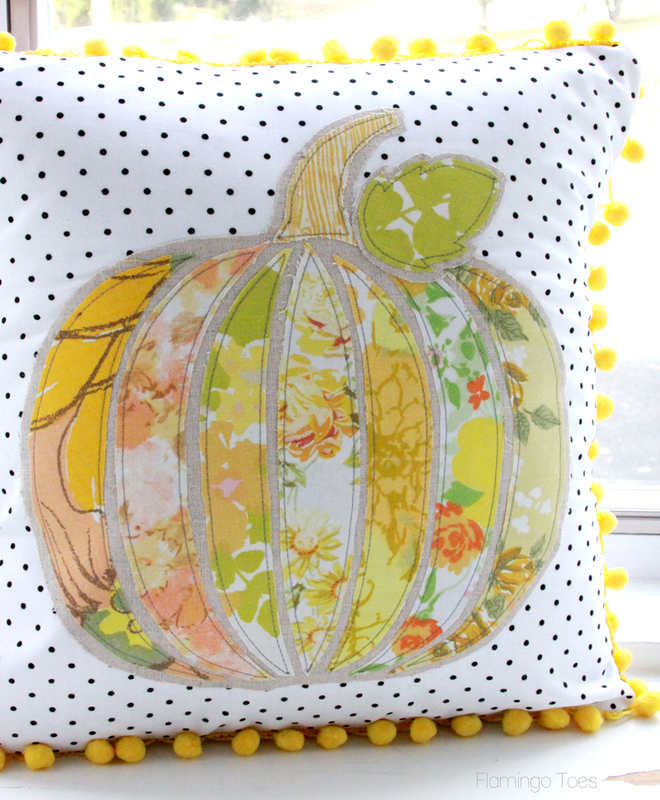 Get into the fall spirit with this sweet pumpkin pillow! 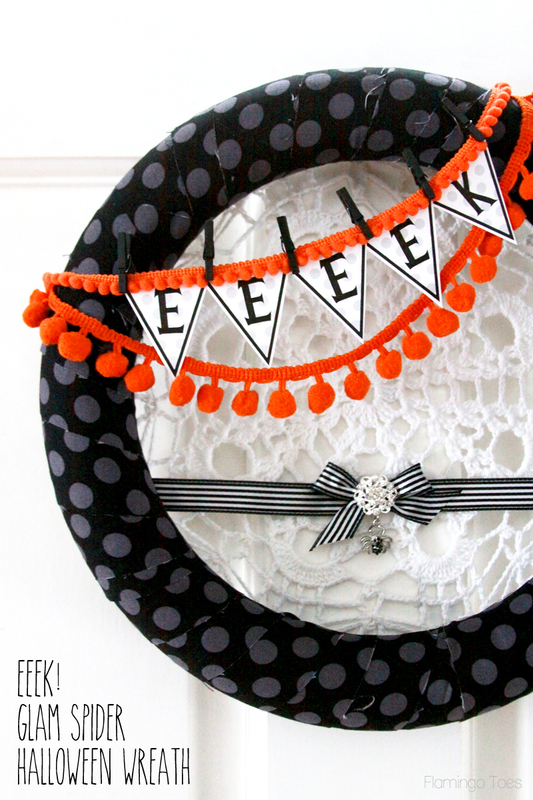 Make this fun and easy wreath for Halloween! 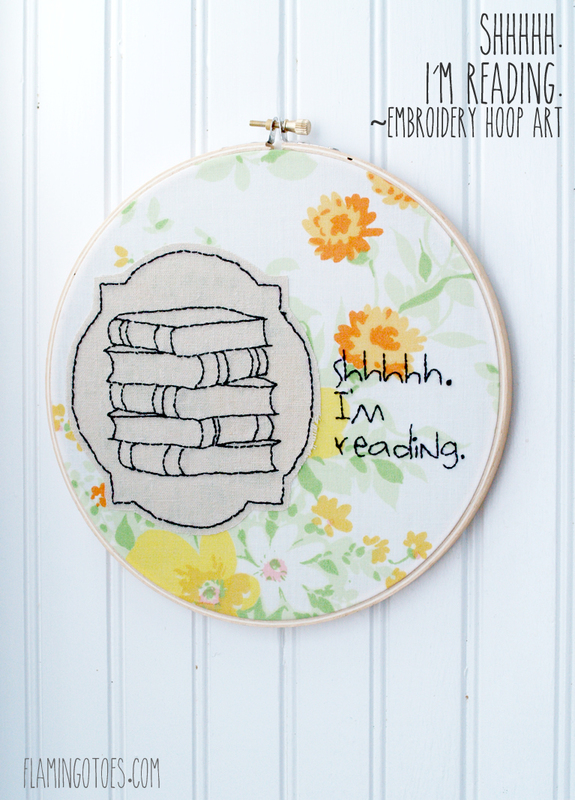 This hoop is so great for book lovers everywhere. 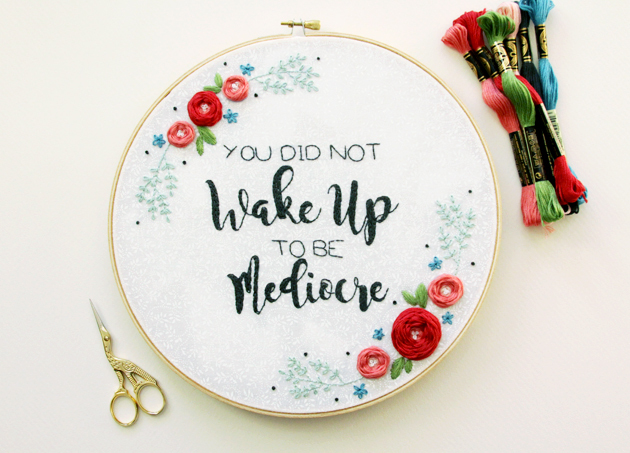 Tutorial and pattern for this sweet hoop art. 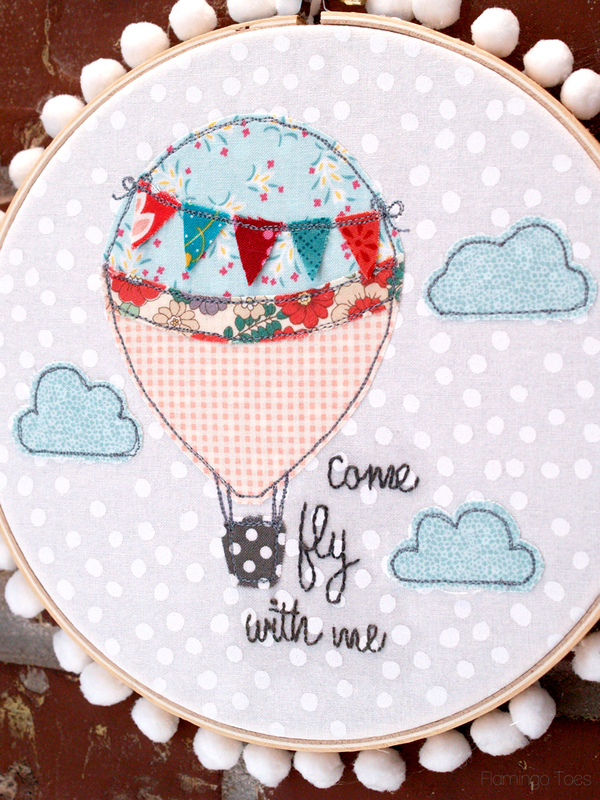 Cute, easy to make hot air balloon hoop. 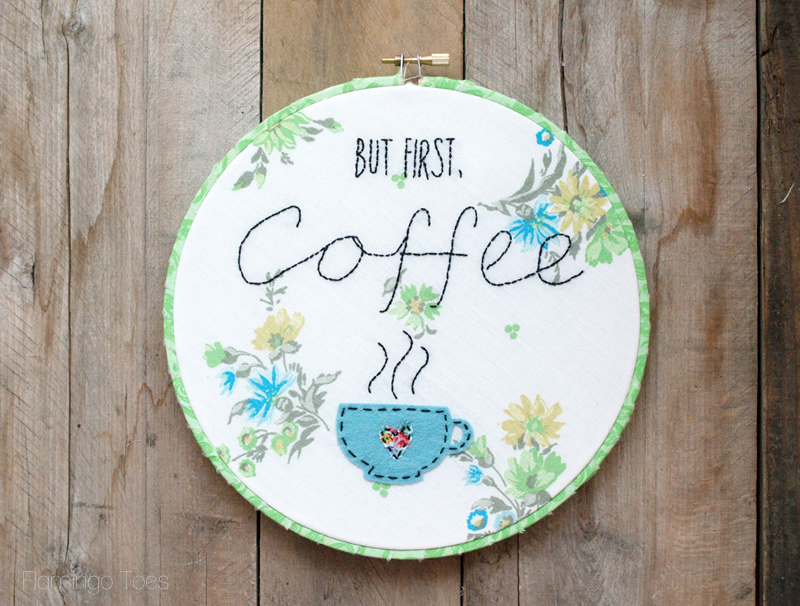 This hoop is so fun, and great for all those coffee lovers! 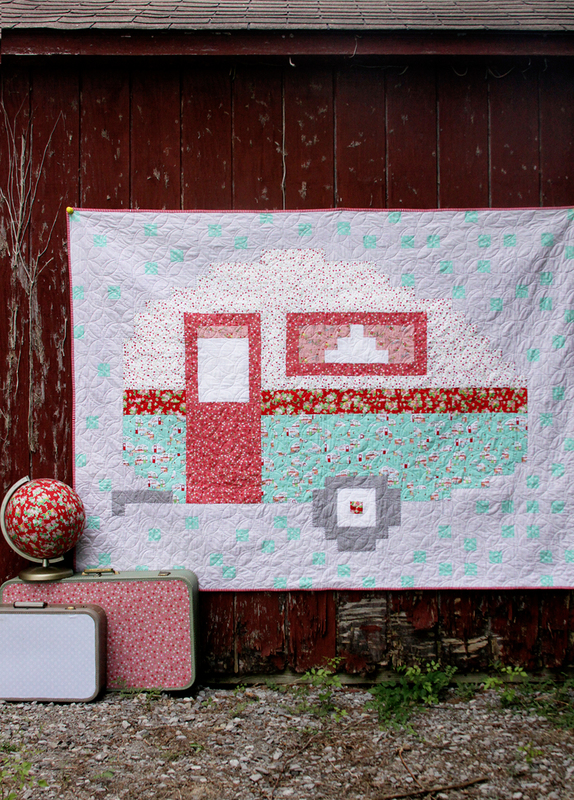 Adorable retro camper hoop art! 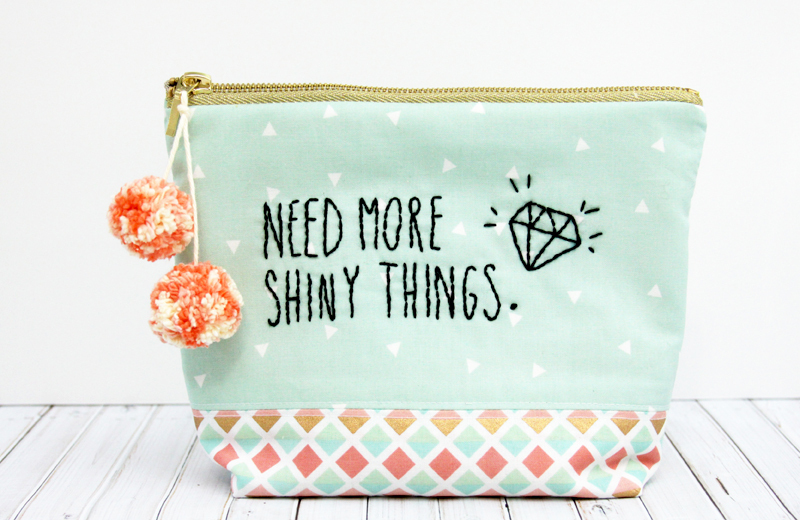 This makeup pouch is perfect for Spring or any other time of the year! 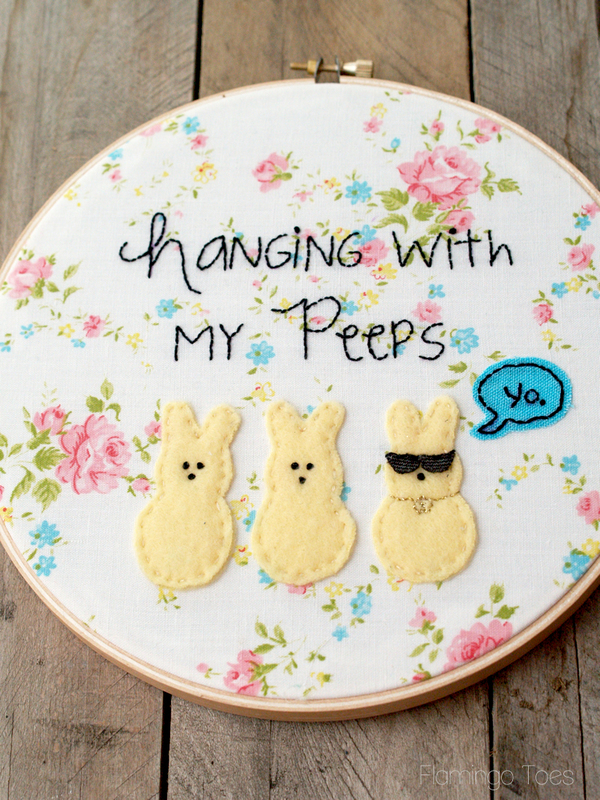 Fun, hip "peeps" hoop art - perfect for Summer! 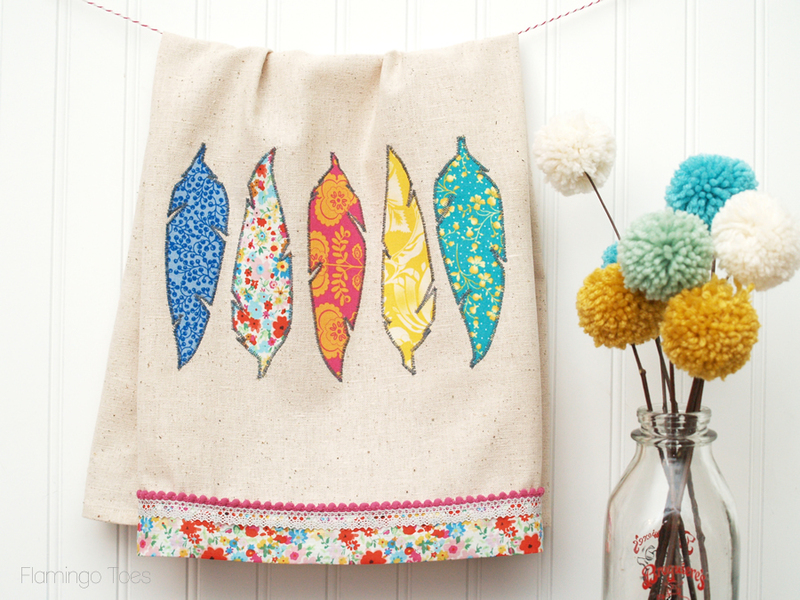 This dishtowel would look cute in any kitchen. 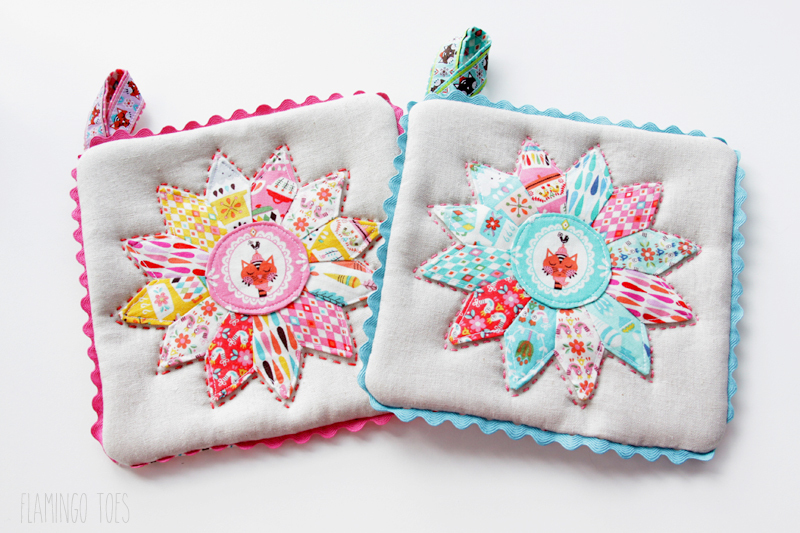 This coin purse is so quick and easy to make! 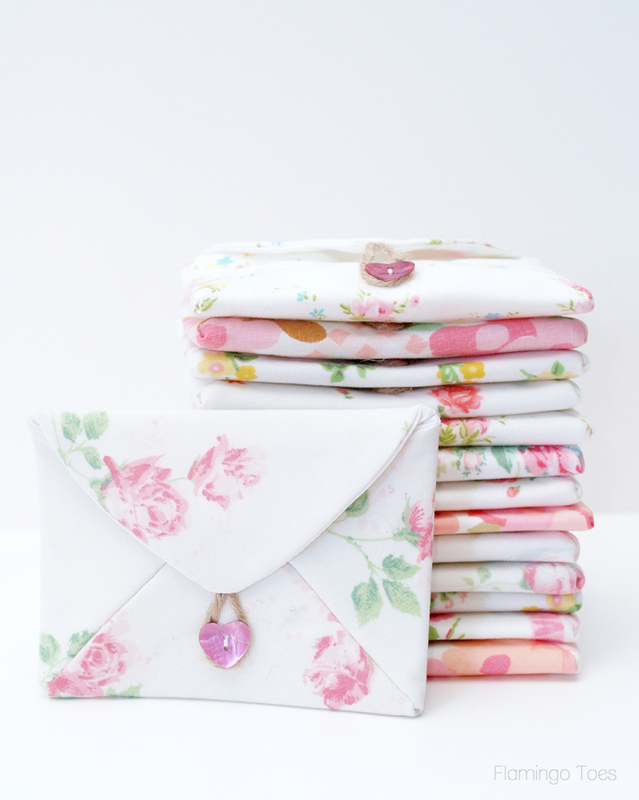 Sweet fabric envelopes, perfect for Valentine's Day! 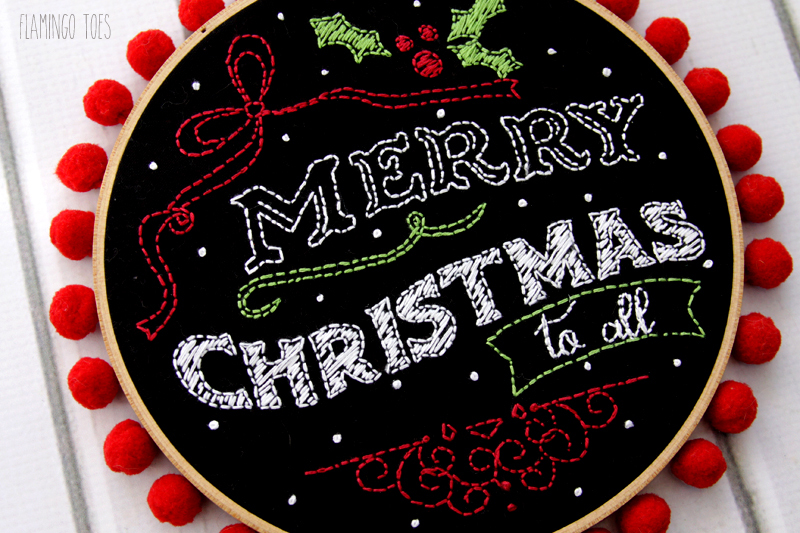 This Christmas hoop art is great for embroidery beginners! Christmas wreath, great for anyone who loves the movie "Elf". 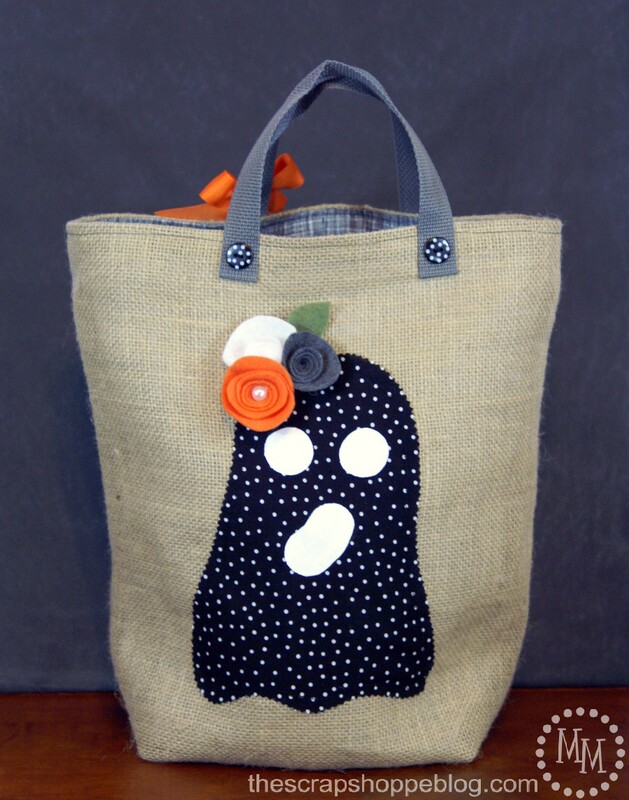 Cute trick or treat bag, great for children! 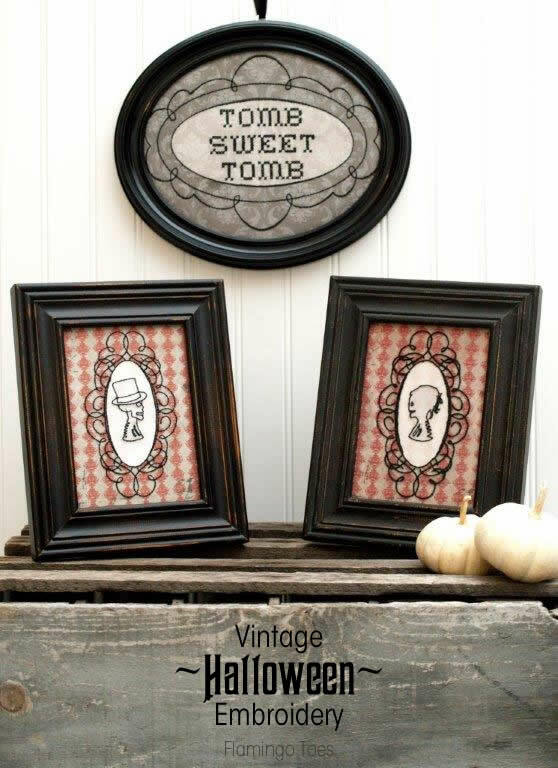 Spooky embroidery and printables for that Halloween mantel! 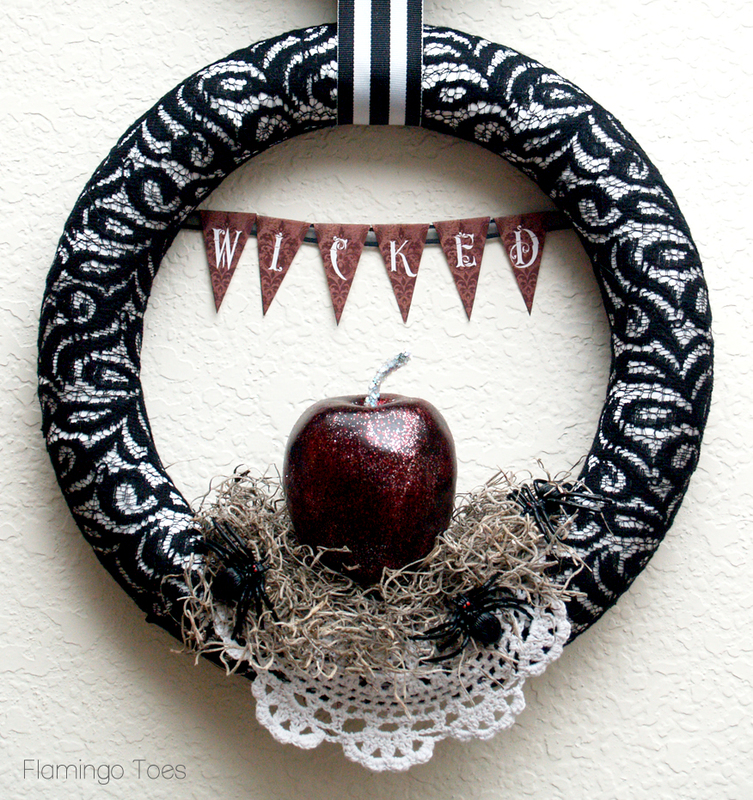 This is a great wreath that can be hung on a door or indoors on the wall. 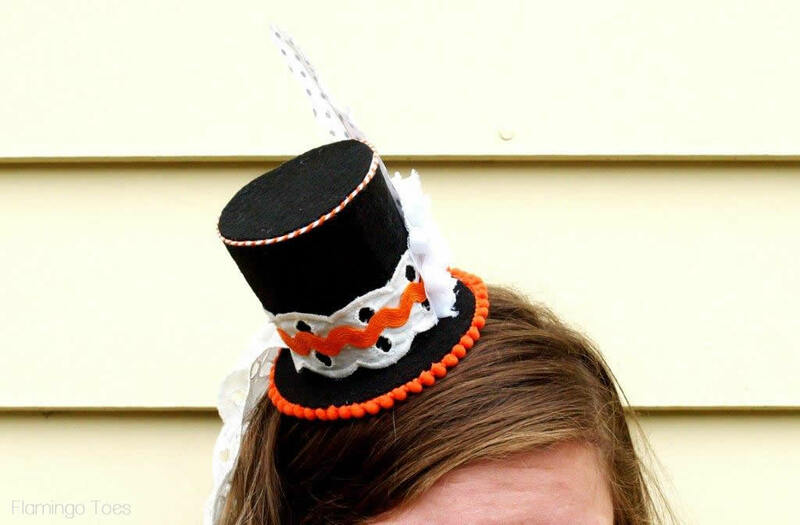 Make this cute top hat for when you don't want to make a full costume! Cute, easy hoop. Goes perfectly with vintage fabric. Sweet, tall arrow & heart embroidered bag. 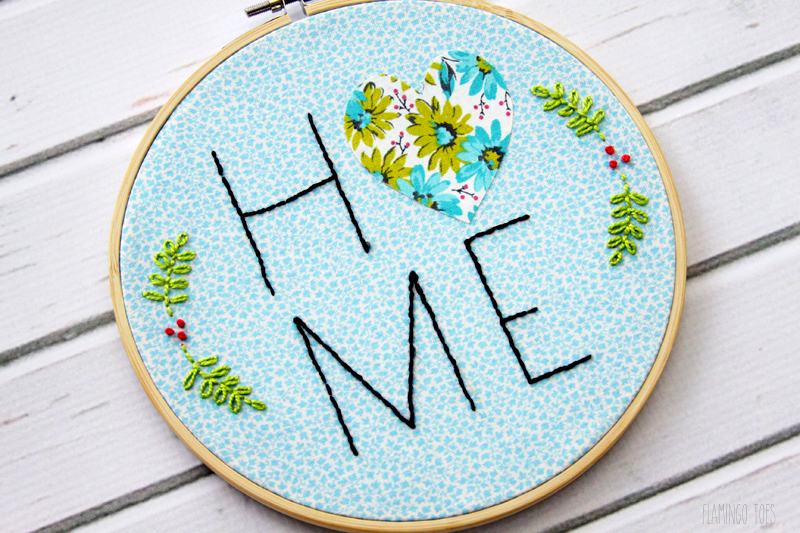 Tutorial and pattern for this hoop that will look great in every home. 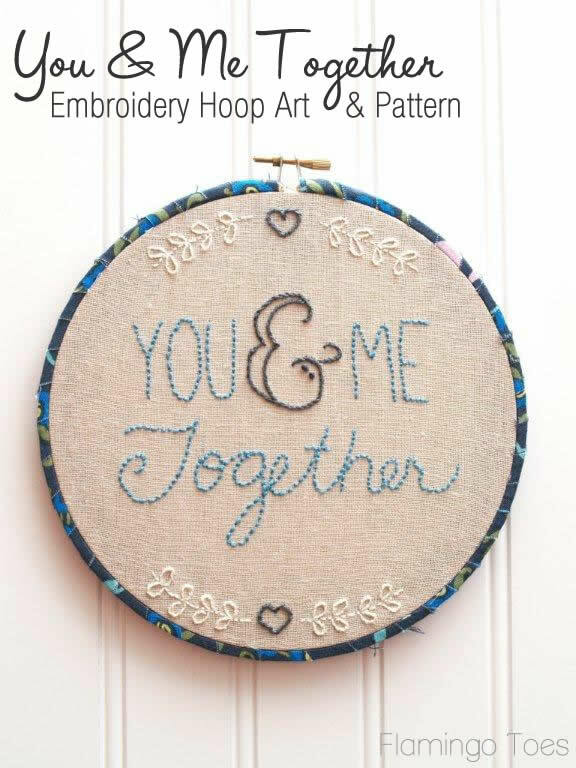 Tutorial and pattern for this sweet, romantic hoop. 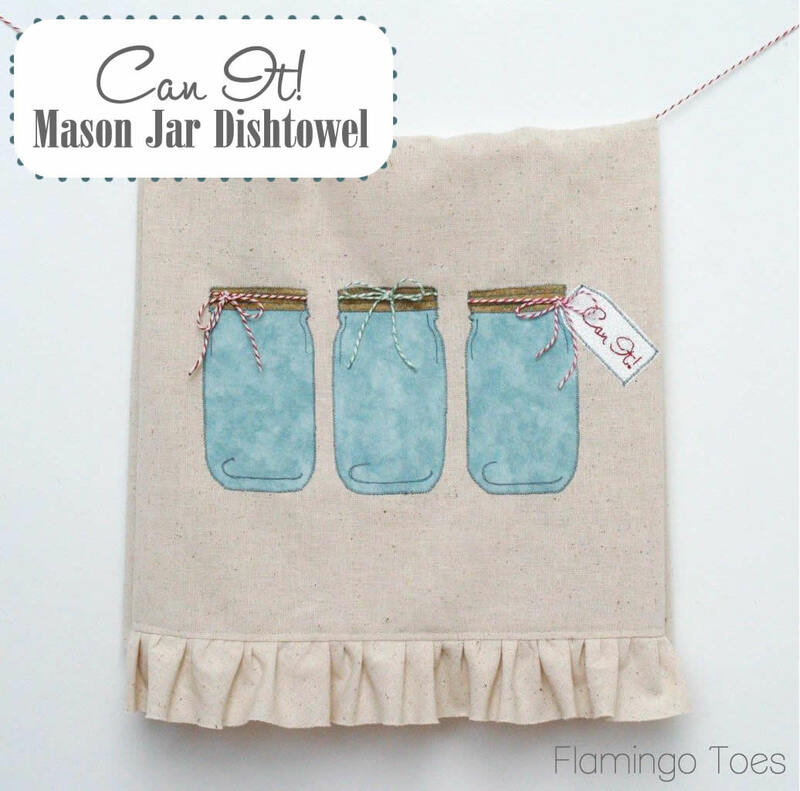 Cute and easy mason jar dishtowel! 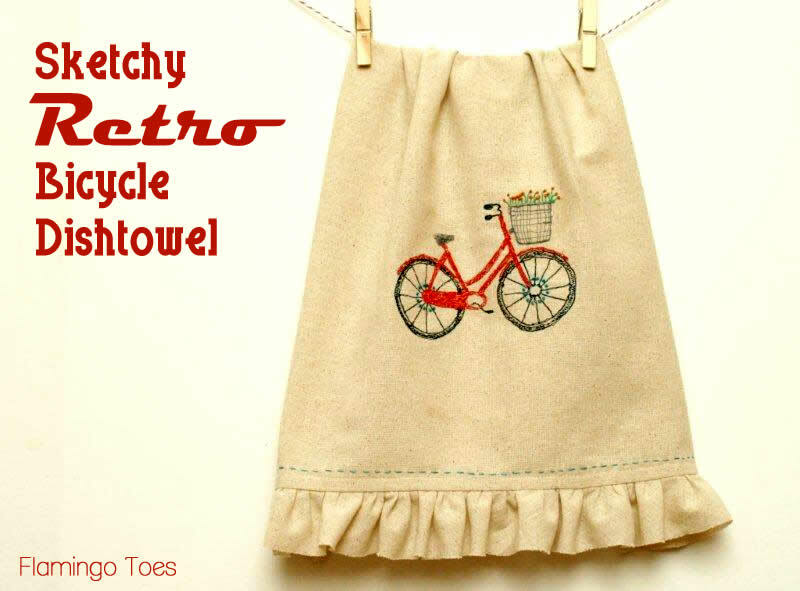 This fun, retro dishtowel is so easy to make! 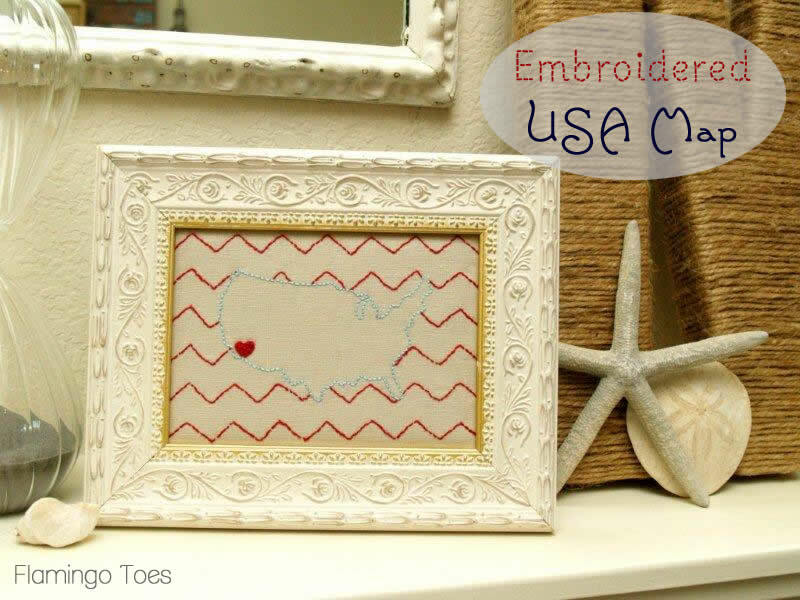 This patriotic map is so easy to make! 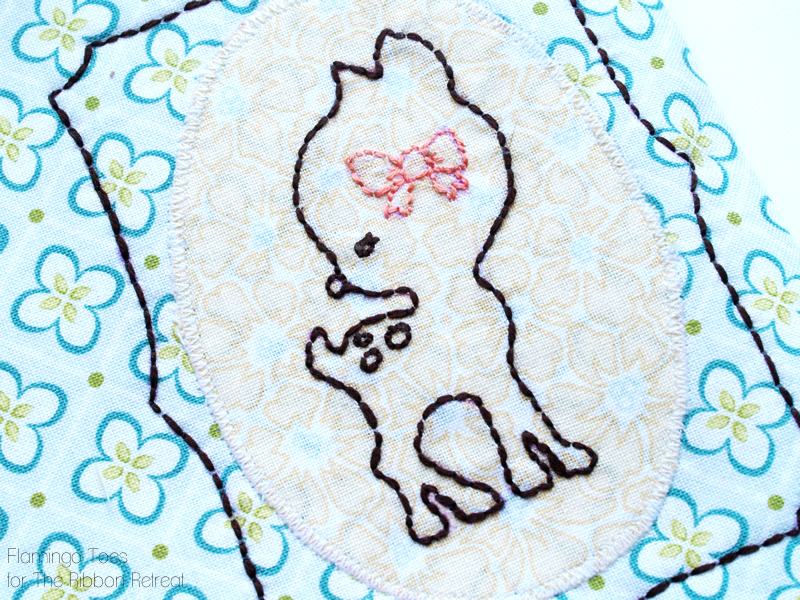 Tutorial and pattern for this cute potholder. 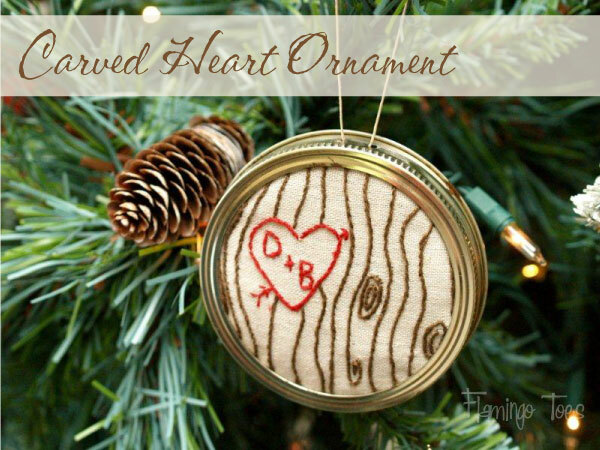 Sweet and simple Christmas ornament. 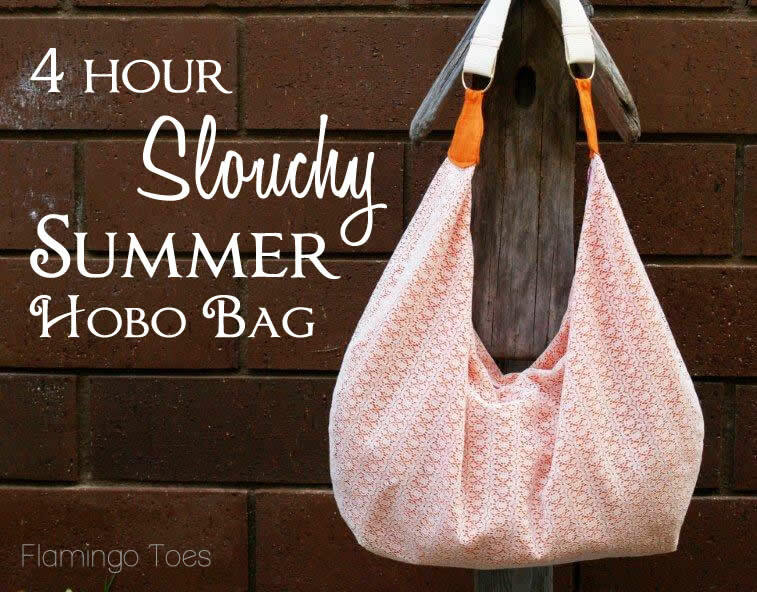 Hello, where is the pattern for the “End of summer wristlet”? I have been following links and all sorts of stuff but cant find the pattern. In August of 2010 you had said you would post as soon as it was fixed. I can sew pretty good, if you could just send me the old pattern, I think I can figure it out. I would like to make one of these for use when I go swimming at a friend house and don’t want to take my whole purse. Thanks so much!! I’m with Lorri! I would love to attempt this. I’m a pretty beginner sewer though. But I would love to try this! Thanks!! Hi, Just read your blog post about the cute Pom Pom Fold over Snap Clutch. There was a link for the pattern in the post but when I tried it, it brought me to a page with other patterns but not for the cute clutch. Where can I find the pattern? Sorry about that, it wasn’t showing up for some reason! I’ve refreshed the page and it’s there now – let me know if you have trouble seeing it. Thanks! Hi Bev, just happened upon your blog. I’m in Chicago, land of the chosen frozen. I love your ideas and can’t wait to try them out. Thanks! The pattern link isn’t highlighted and therefore I am not able to get the pattern for the fabric envelopes. Could you please send me a functional link to the pattern piece by e-mail or as an attachment? I’m looking for your “You’re So Hot!” potholder pattern. It was featured on a sewing site, but the link is broken. And I can’t find it on your site in patterns or in your search box. Hi Kay! Here’s the link to the post: http://www.flamingotoes.com/2011/09/a-little-pot-holder-love/ Sorry you had trouble finding it! Hi Bev, Just joined the group. Very nice blog. I would like to know if you have a pattren or tutorial for that beautiful polka dot blouse(gray) with the ruffle collar. I just love it. Would love to see the pattern too! yarn to make more. Thanks for the pattern!! I just found your website and would like to make the deer plaid dish towel pattern, but I can’t find it on the website. Can you help? I really want to make your mug cozy, but can’t find the pattern on your “patterns” page. Please can you send me a link? I can see the post but it won’t give me the pattern. The link for the pattern takes me back to this page and it isn’t here. Oh well! Oh sorry! I’ll fix that as soon as I can get to a computer, we’re on the road right now. It’ll just be a few hours! That would be wonderful! Thank you so much and have safe travels. I’ve updated the post so the Mug Cozy Pattern link now actually goes to the pattern. :) Thanks again for your patience on that and let me know if you have any problems getting it! merci beaucoup pour toutes vos belles réalisations . The pattern is uploaded Gena, but I’ll email it to you now. Thanks for letting me know it wasn’t showing up! and its not on your pattern link list could you send me the pattern? Here’s the link to the Handkerchief Apron – http://www.flamingotoes.com/2014/12/colorful-vintage-handkerchief-apron/ Thanks! Thank you for sharing the cool ideas that you and others come up with. It’s so inspiring and lights a fire under me to take up again many of the crafting practices I had enjoyed in the past. I believe you have an error on the directions for the Map Quilt Tutorial on the Fabric.com site. Instructions say to “Place Alaska and Hawaii in the bottom right corner.” In the photo, Alaska and Hawaii are on the bottom left. Thanks for letting me know! I’ll see if they can update that. If you scroll up to the top of this page, under the photo of the map is the phrase US MAP QUILT PATTERN. If you click that phrase, you will open the PDF of the pattern. I’ve clicked on Printable USA map and it brings me to the page with free downloads but there is no map. HELP!!! The link to the map is under the photo of the Map Quilt, at the top of this page. Thanks! Hope to make the US map quilt for my grandnephew and grandniece. Just printed off your usable map pattern. Thanks! Now, if you can just sell me some time to make it. What is the finished size of the united states map quilt would love to make it into a wall hanging, but not sure of the size. Can I make the pattern smaller? What size printer paper for the USA quilt pattern map? My printer only has paper tray for letter size. Is “full size” meaning legal size paper? The map is printed on regular 8 1/2 x 11 paper. I just meant that you want the printer settings to be at full size, not smaller or enlarged so the sizing of the actual states isn’t off. Let me know if you have any other questions! I can’t wait to make this. Thanks so much for sharing the pattern! Always wanted to try a US Map quilt; thanks much for the free pattern! 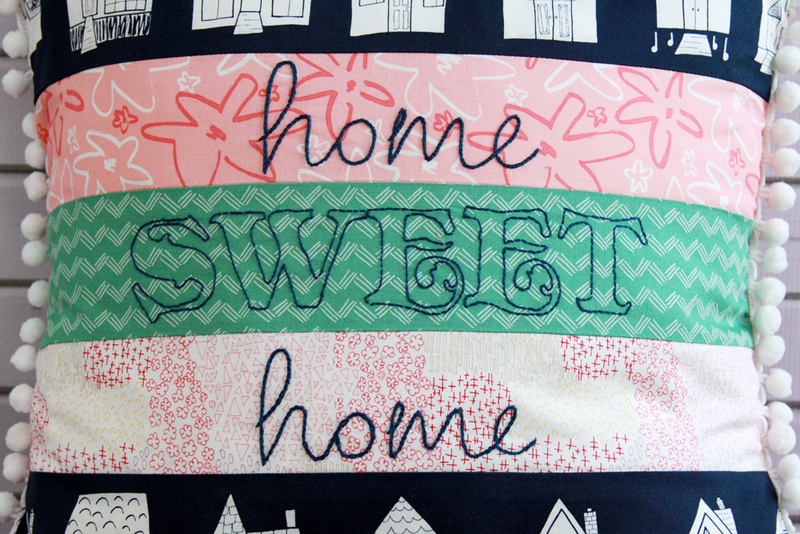 I cannot find the map quilt tutorial on the Fabric.com site. Could you give me a hint?? I love your site! and everything about it!! Can I come to your house and you can teach me all your wonderful skills :) !!!! Thank you for sharing your gift! 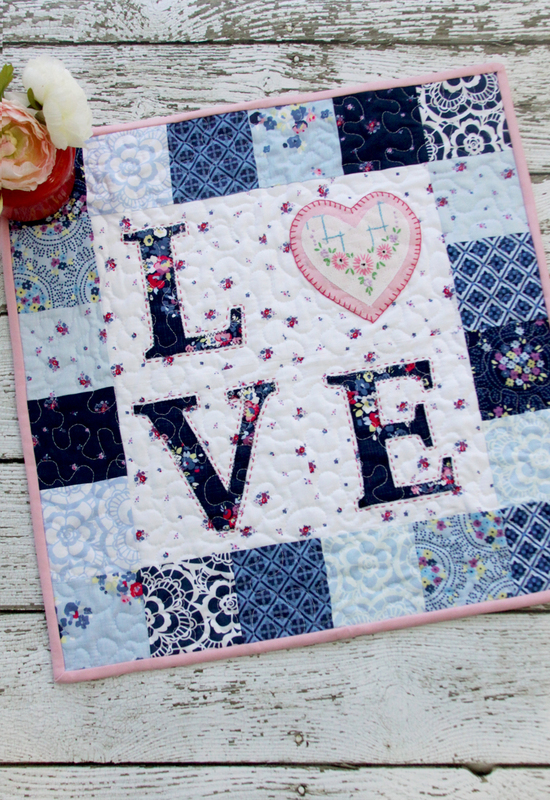 I just came across your site via fabric.com about your new Sewing Room quilt and I love it. I pin your designs all the time. I love every one of them. You’re a creative genius! You are so sweet Taish!! Thank you for the sweet comment! So I’m looking for the free Pixilated Flamingo Pattern, & I keep clicking on what looks to be links, but I’m not finding it. What am I doing wrong? 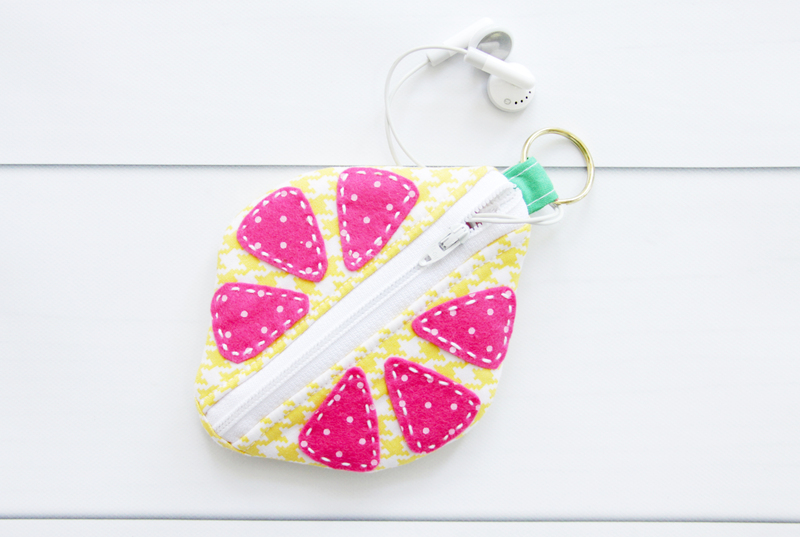 The pattern is in this post: http://www.flamingotoes.com/2016/09/diy-citrus-earbud-zipper-pouch/ at the bottom of the materials list. Thanks! Just found your blog nd like the patterns especially the pixel flamingo….cannot seem to d/l the pattern….can you help….wanted to make it for great granddaughter’s 1st bday….she likes flamingos altho she doesn’t know it yet…. Can’t seem to download also! I will email you the layout Linda. Sorry you’re having trouble! Good morning and happy Thursday. I’m here in Washington State and it is 12;21 on Wednesday the 28th of June. I copied the above post because I’m having the same problem. Would you believe that I’m from Washington state, too!!! Just found your website…love it!! 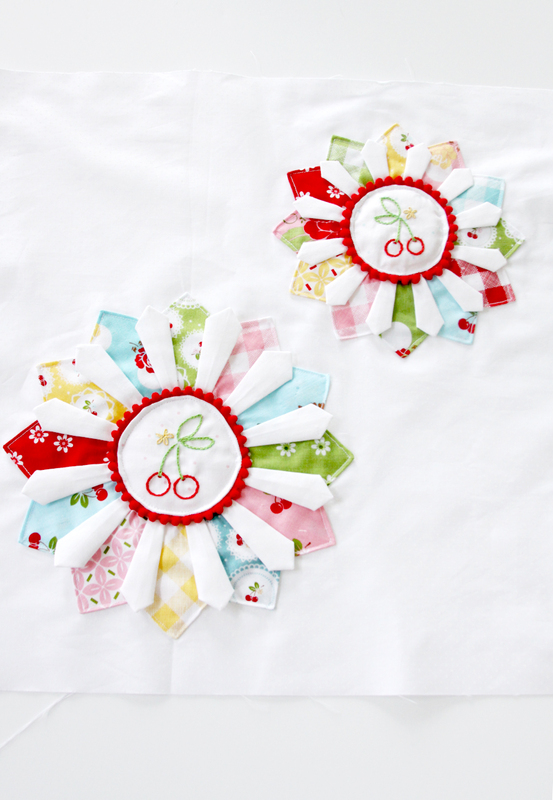 I especially love the SPRING RIBBONS AND BOWS TABLE RUNNER. wow!! Have tried numerous times to download layout pattern without any success. Can you please help!!! Sorry about that Rosemary! I’ve updated the link to the layout PDF in the post: http://www.flamingotoes.com/2016/03/spring-ribbons-bows-table-runner/ Let me know if you aren’t able to open it. I’m so glad you like the website! 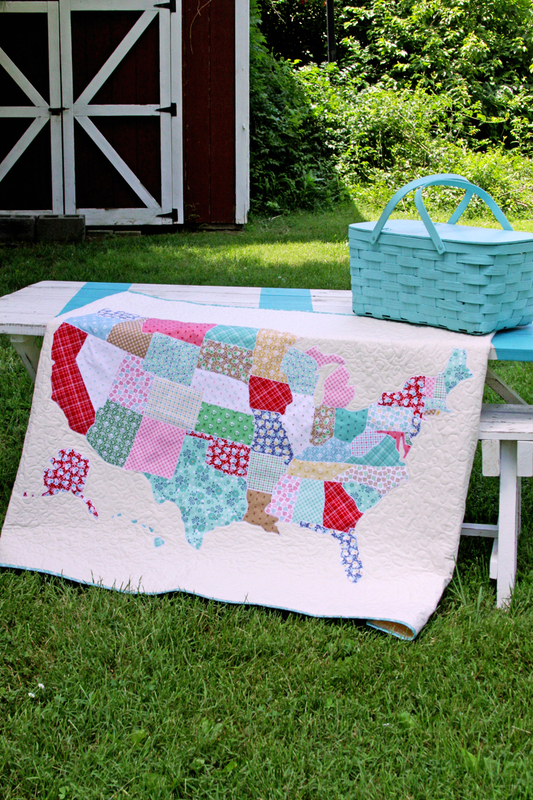 All of your projects are cute but the U.S. map quilt is just adorable. Thank you so much for sharing. Hi Beverly! 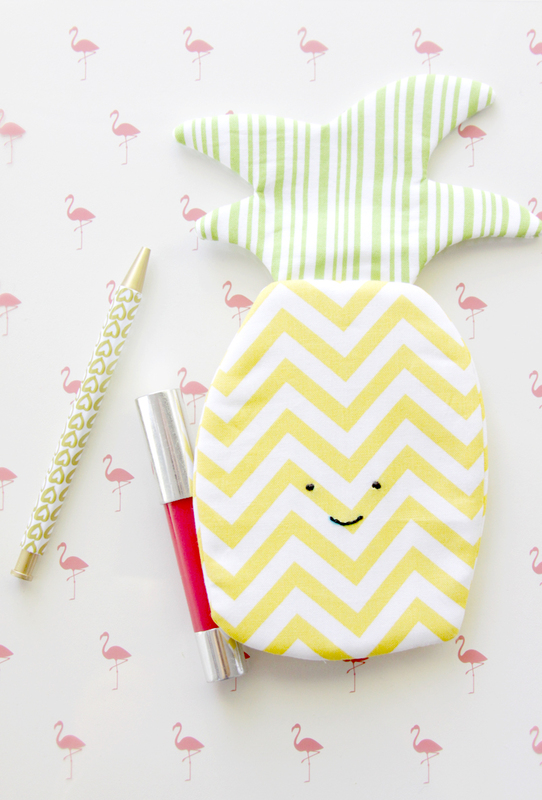 Your Pineapple Zipper Pouch is adorable! My 11 year old is going to attempt making it – first time for her to sew something with a zipper! I am having a difficult time trying to download the pattern. When I click on the link in the tutorial it takes me to your page with all your patterns which then takes me back to the tutorial. The pattern would be much appreciated. Thanks for sharing all of your beautiful designs! I love the Valentine’s Day note garland. I can’t access the pattern for the envelope. When I click the link, it is a circle taking me back to Lil’ Luna. Just found your “wee little gnome pom pom” – this is soo adorable. In the directions it has the hat pattern (which you can click on for the actual pattern) but when I click on that I just keep going back to the complete directions for the gnome – can you pls tell me how I can get the pattern for the hat for this cute little guy. Many tks. Are you clicking on the Hat Pattern in the materials list in this post? 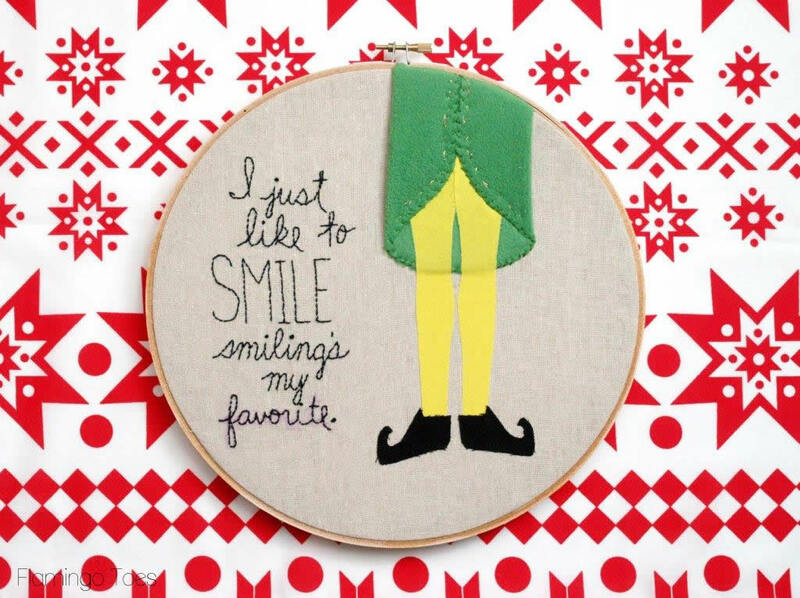 https://flamingotoes.com/2017/11/wee-little-gnome-pom-pom-ornaments/ I just checked it and it opened the PDF pattern for me. If you aren’t able to get it to open it, let me know and I’ll email it to you. 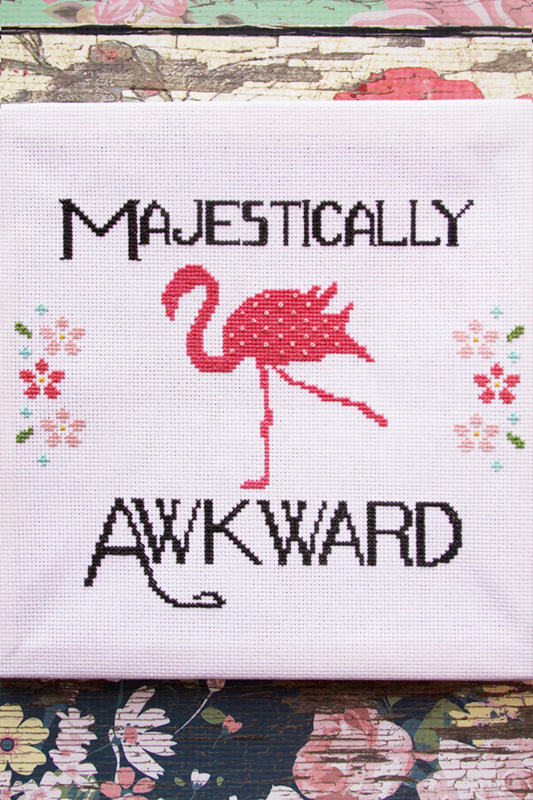 Hi Bev have been trying to download this flamingo pattern for 2 days without any luck. Please could you help me as want to make this for my great granddaughter. Thank you Bev. It’s not possible to download the ‘free’ Pixelated Camper pattern. A message shows up that it takes some time… but it never happens. Hi Beverly, I fell in love with your Houses Table Runner–very fun to make so I made three. Just posted the pic on facebook and got 481 Likes/Loves/Wows. I’m not sure if you can get in to see them but I did post your link because several asked where I got the pattern. 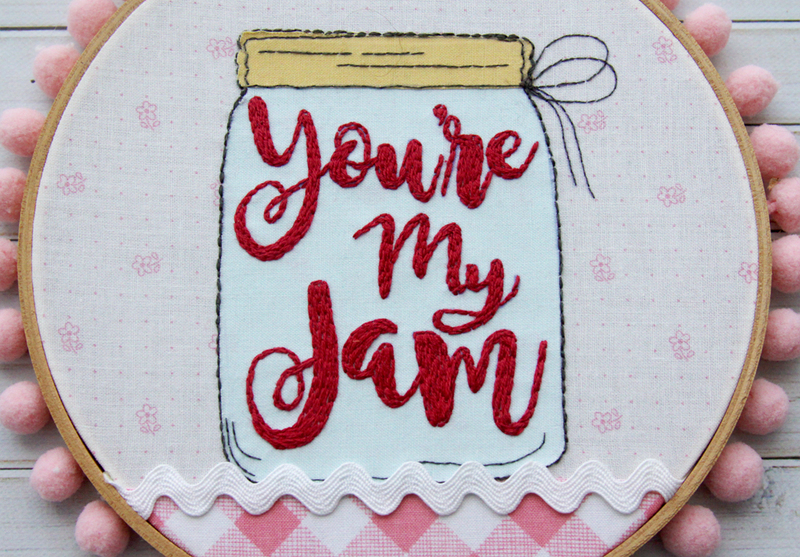 Thank you so much for sharing this adorable pattern! 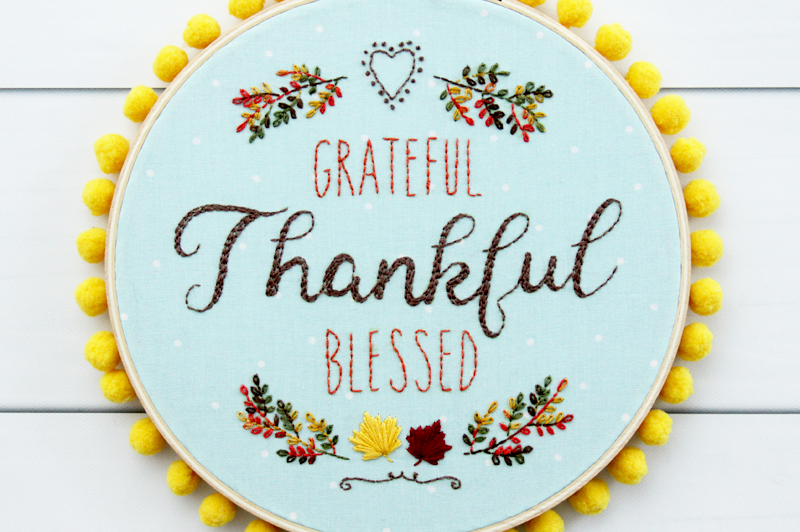 Thank you so much for sharing a link to the pattern Randi! That means so much to me!